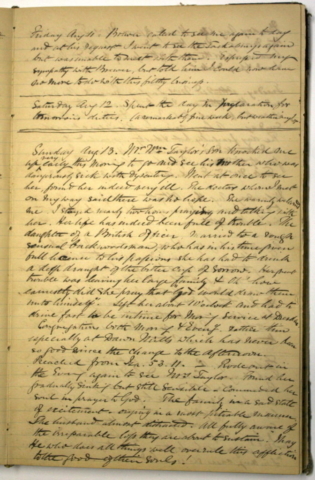 Thomas Hughes (1818-1876) was born in Staffordshire, England and died in Dresden, Ontario, serving as priest in the Anglican churches he had founded in the region. 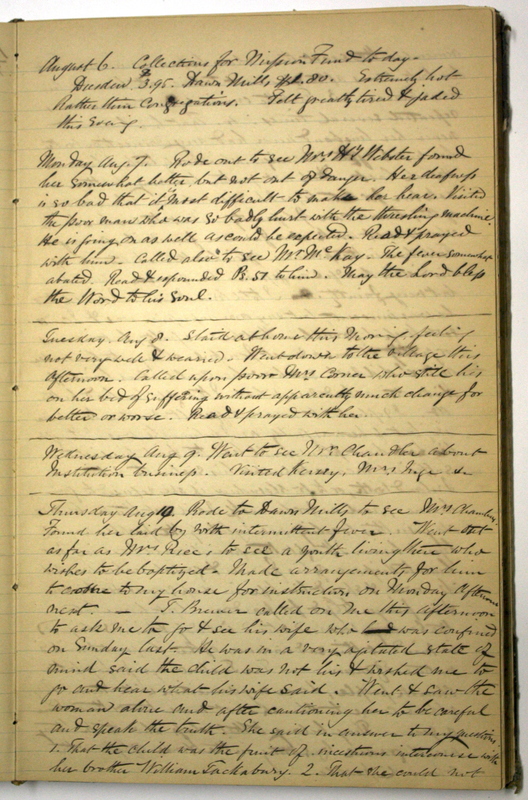 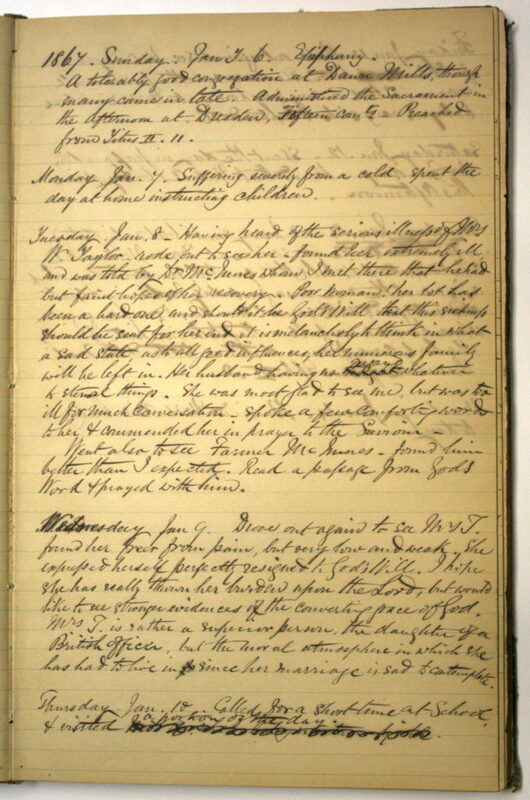 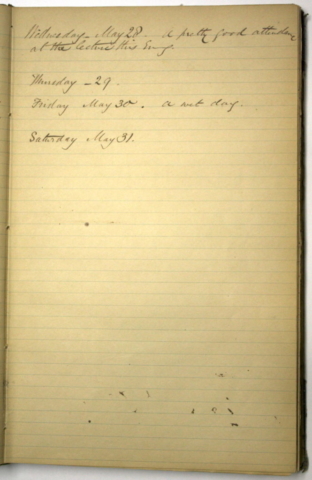 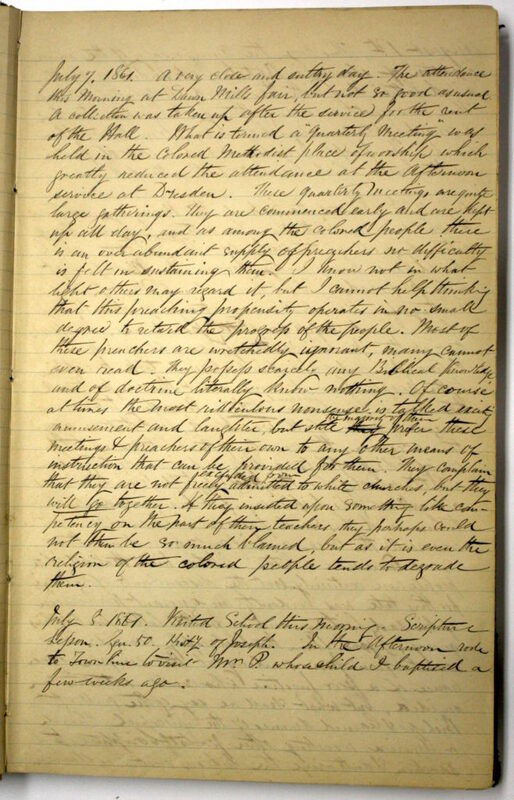 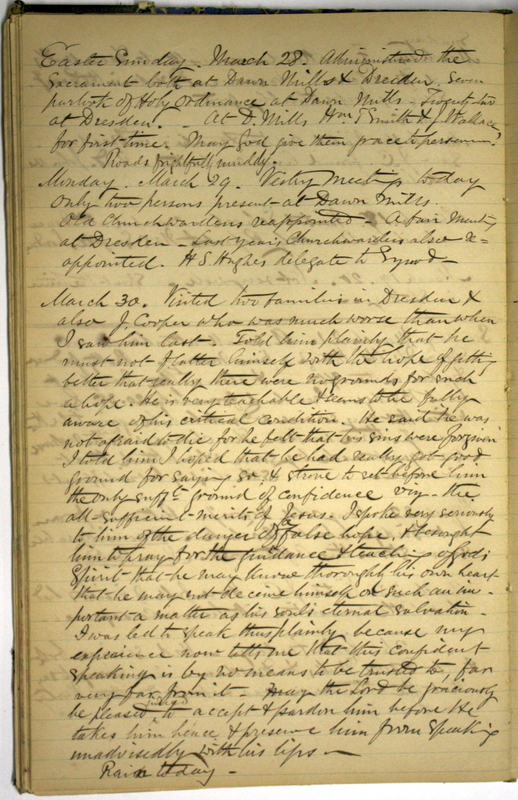 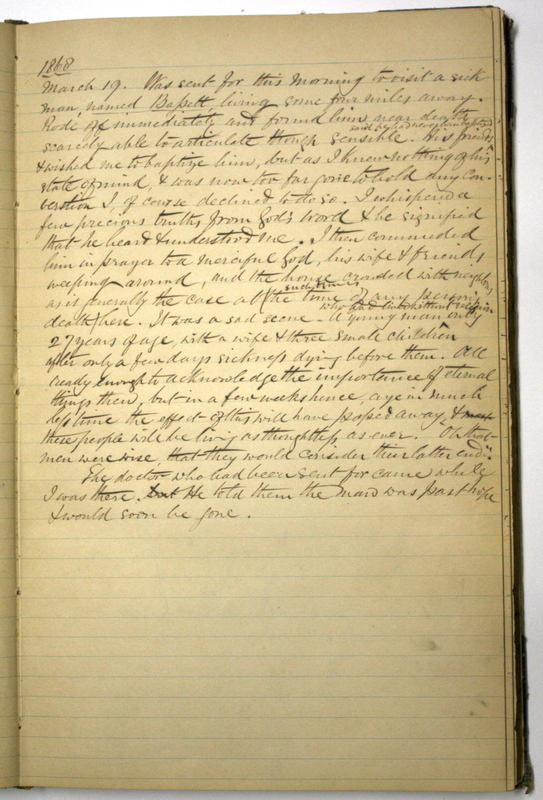 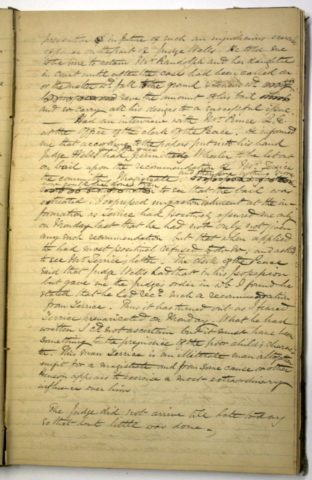 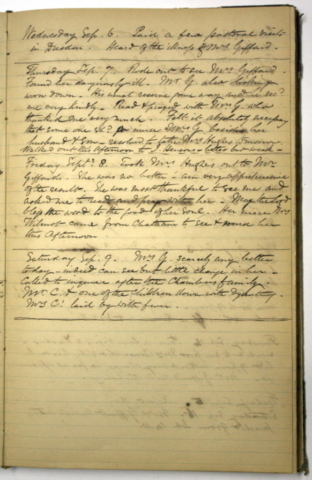 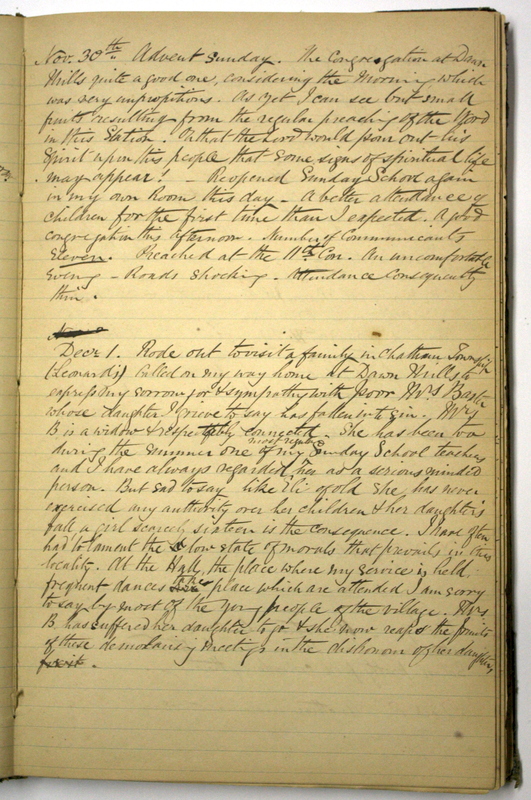 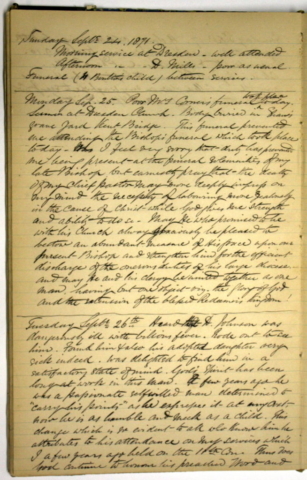 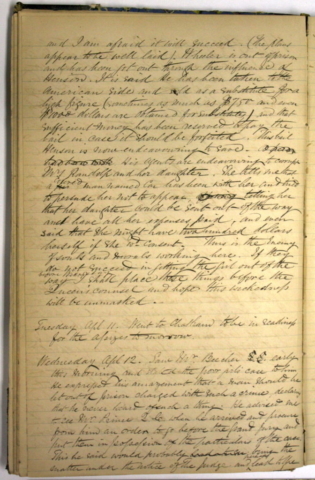 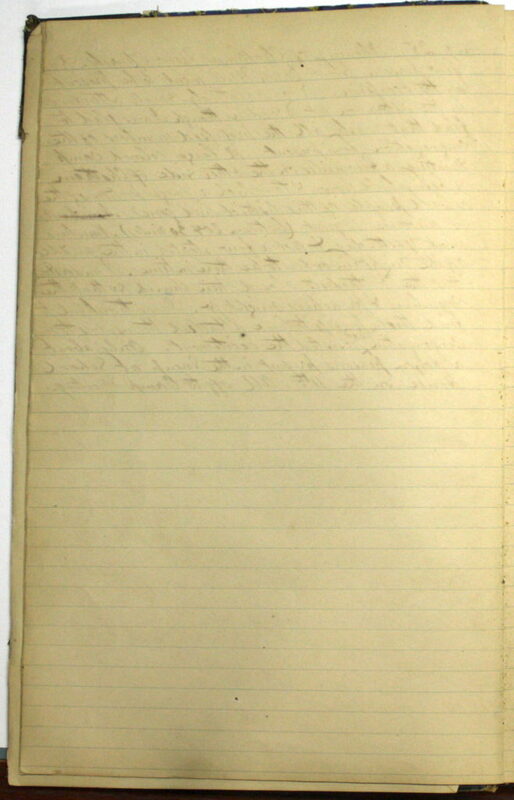 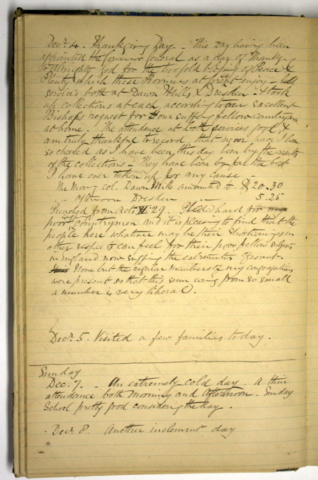 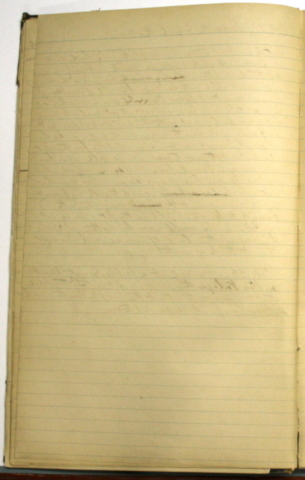 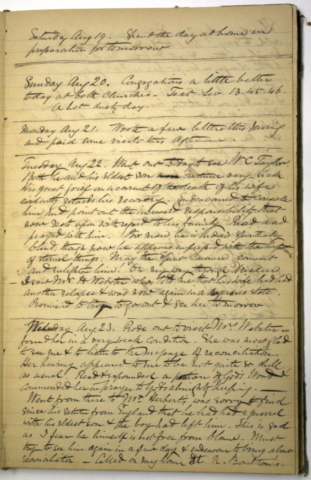 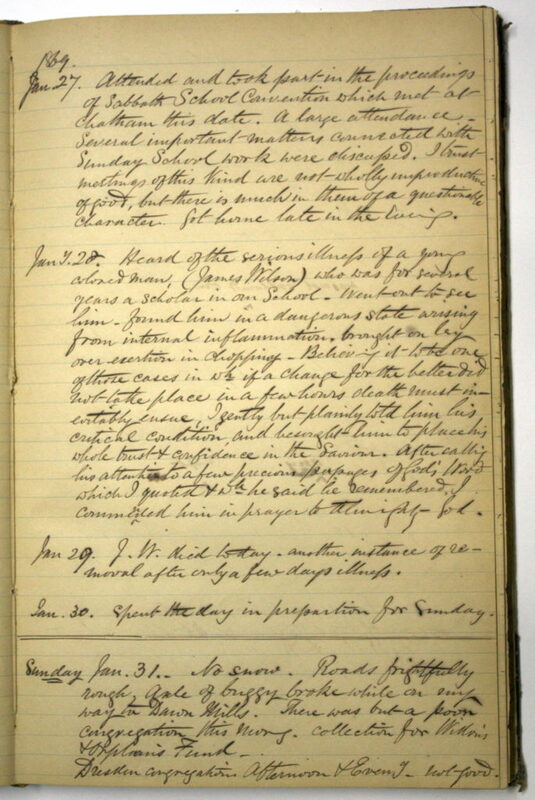 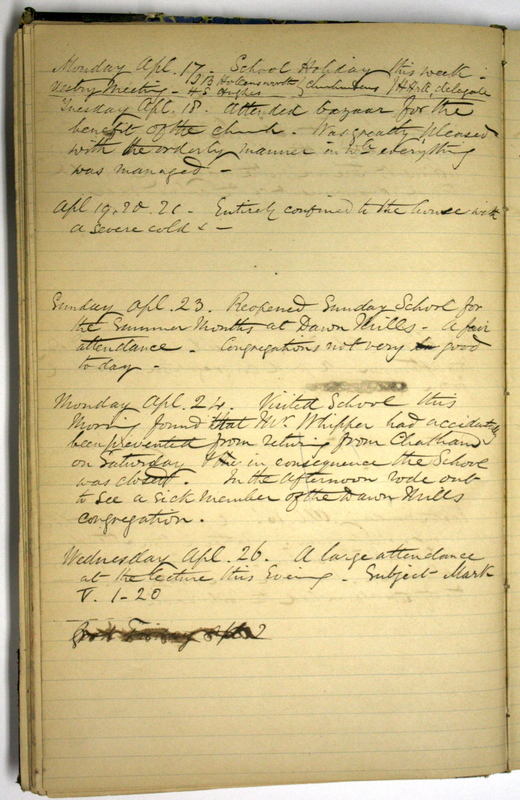 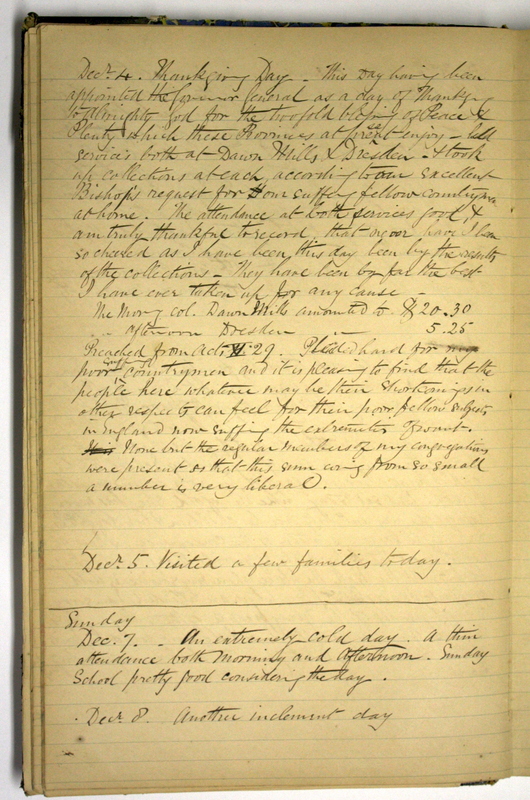 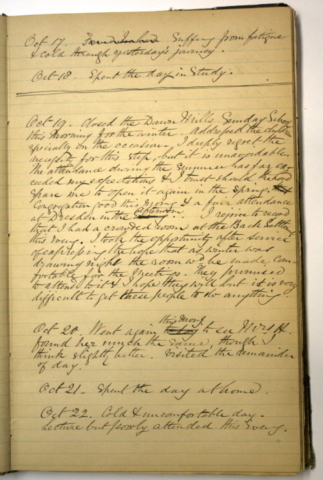 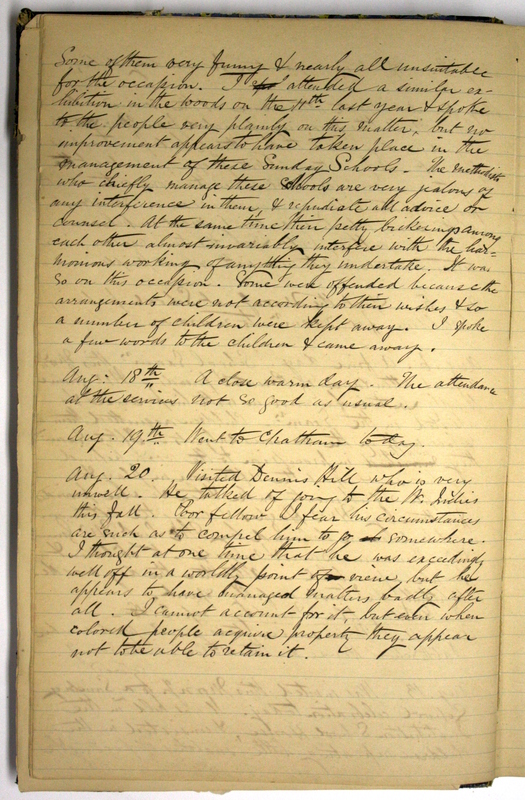 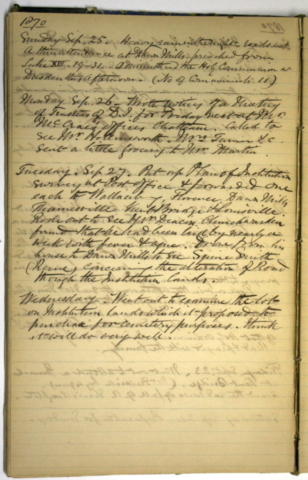 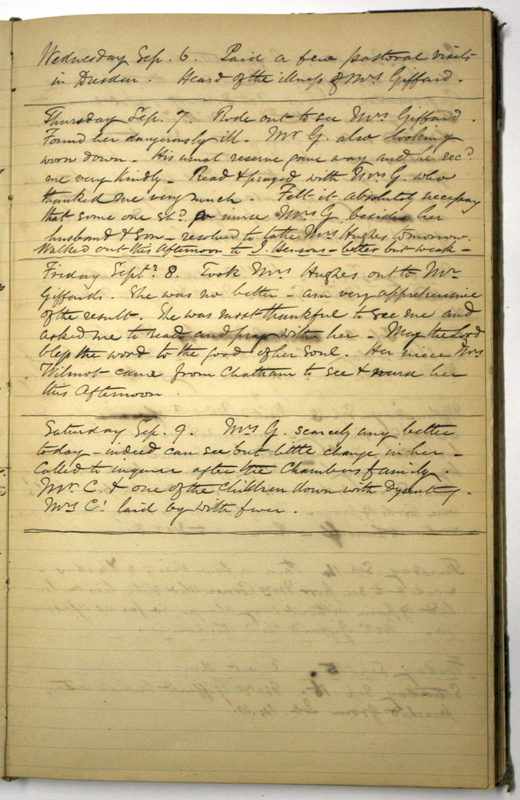 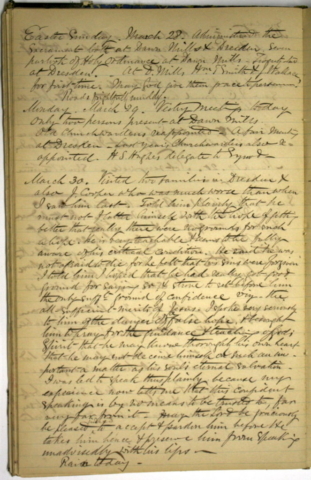 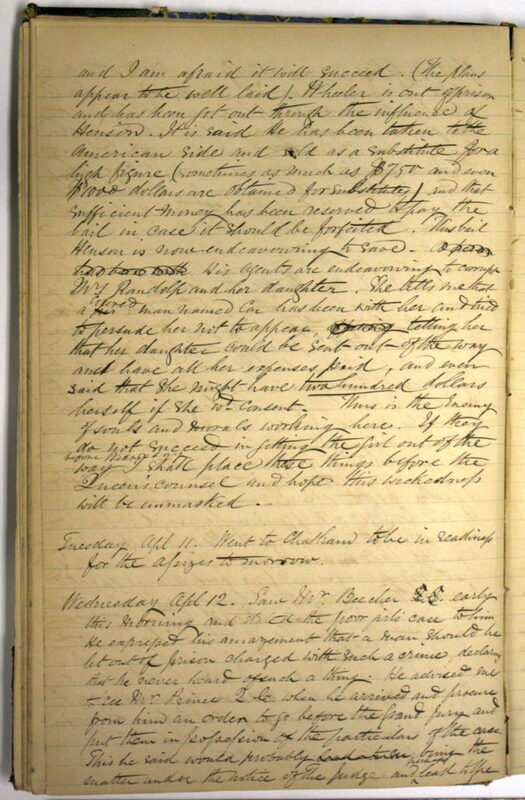 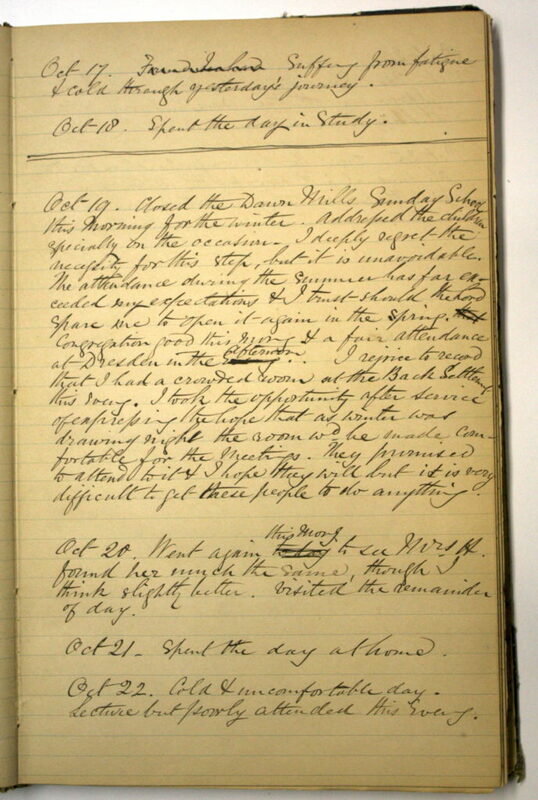 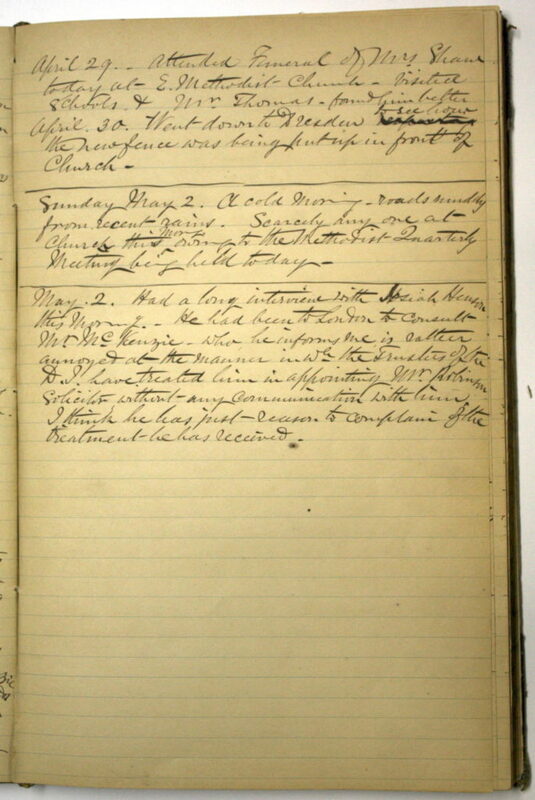 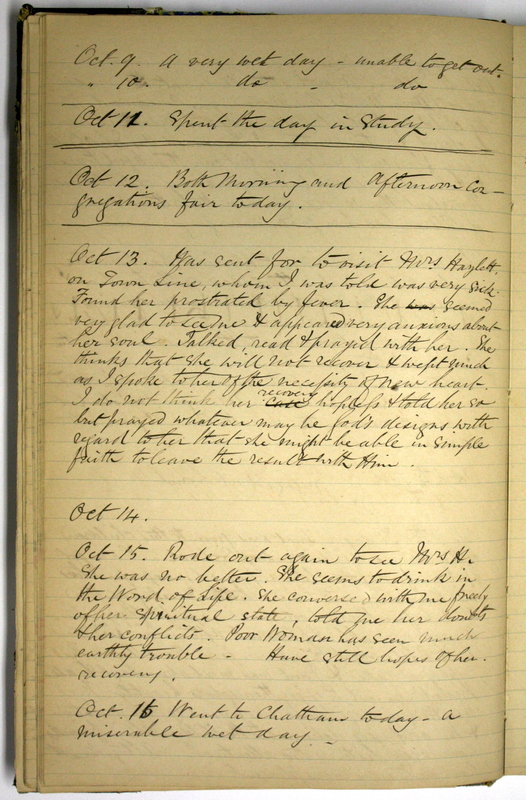 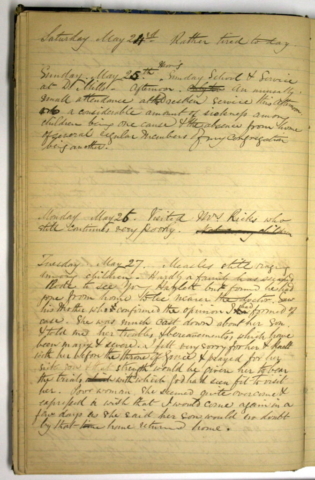 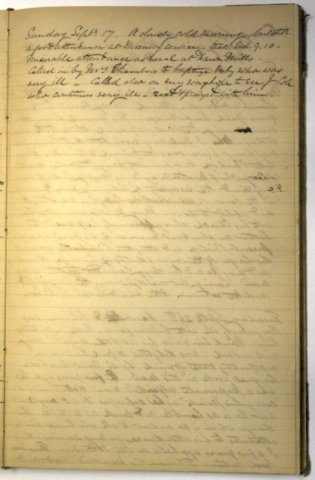 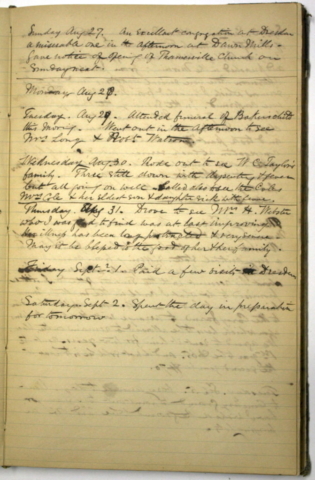 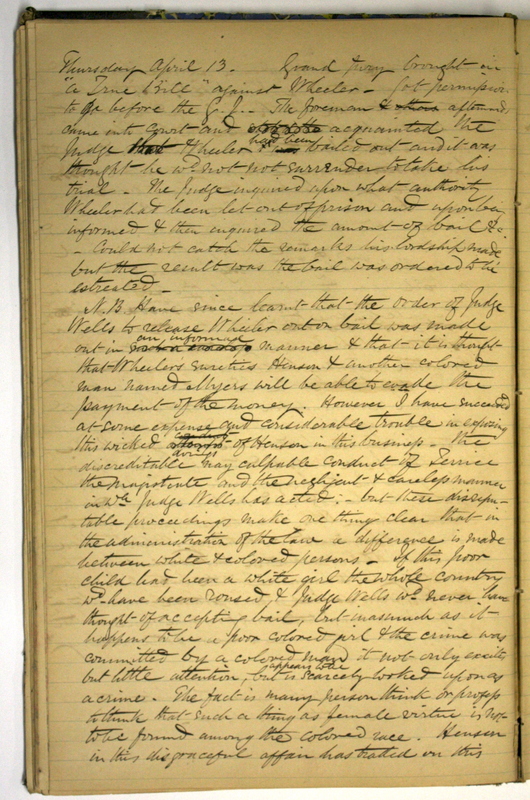 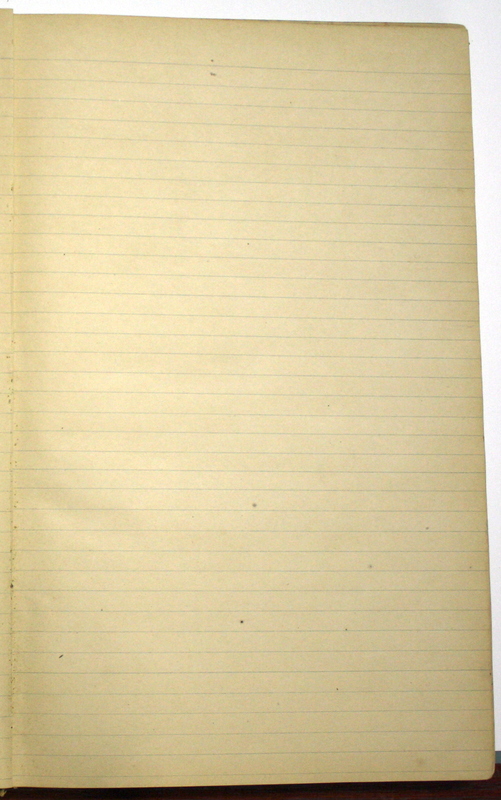 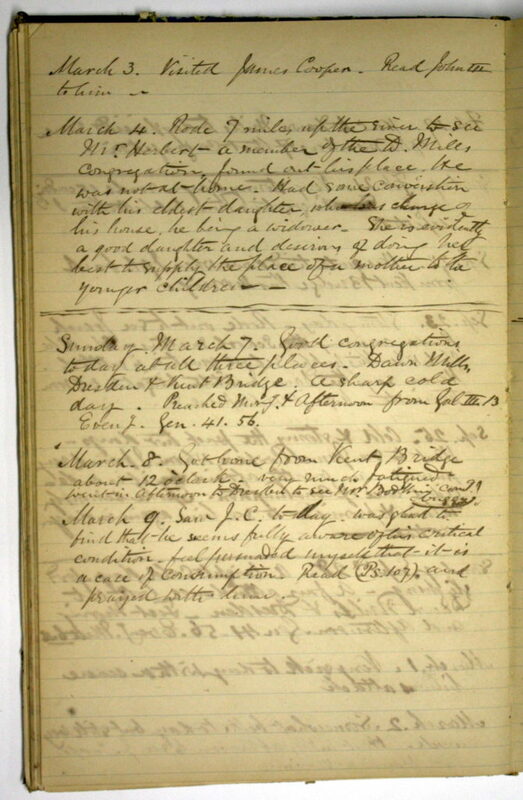 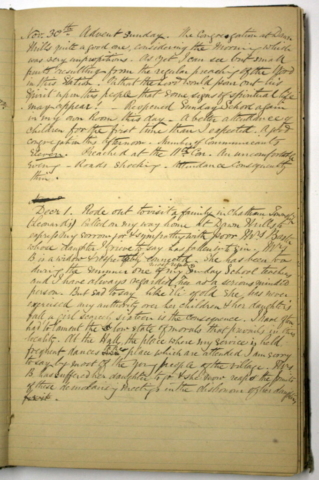 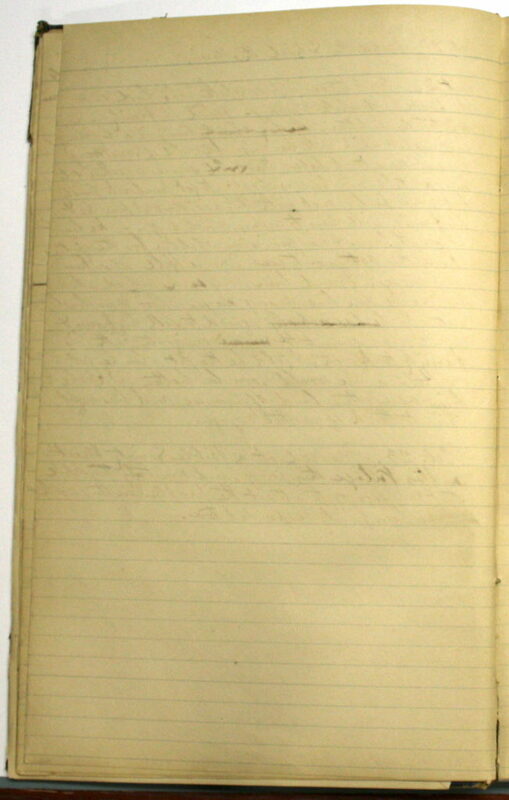 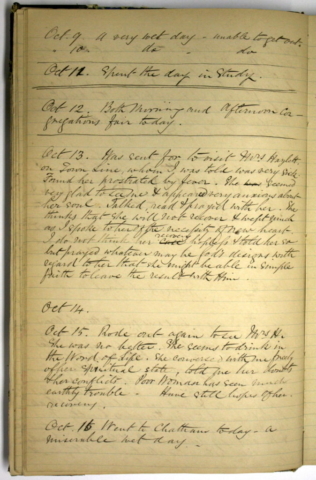 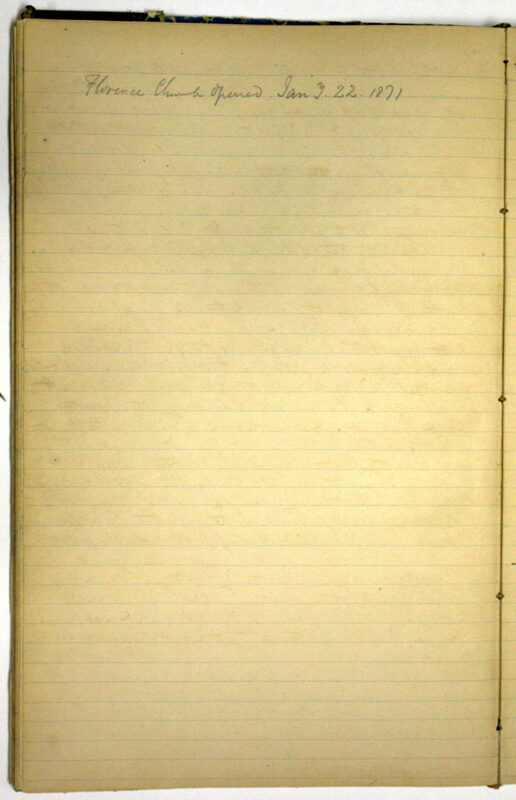 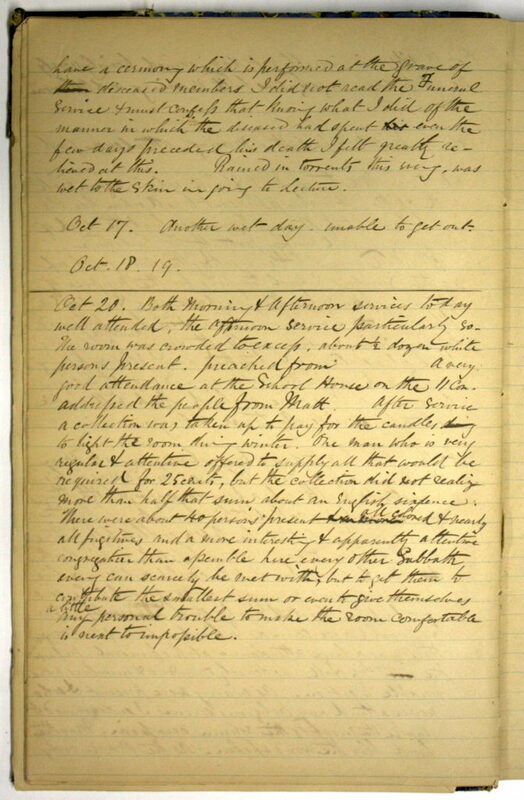 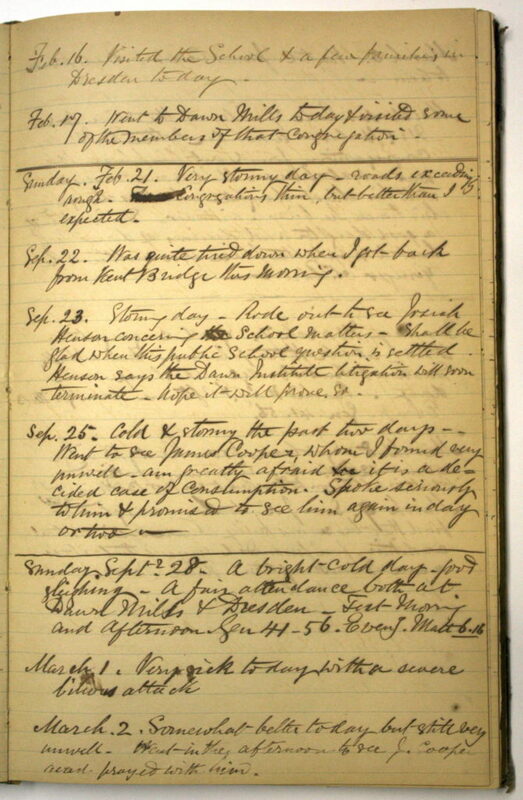 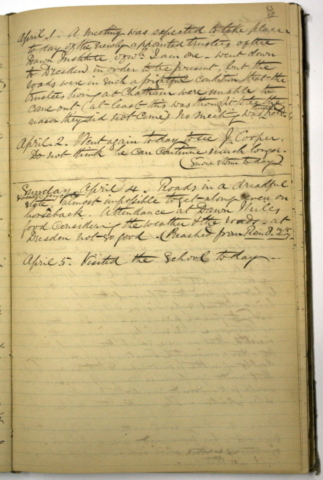 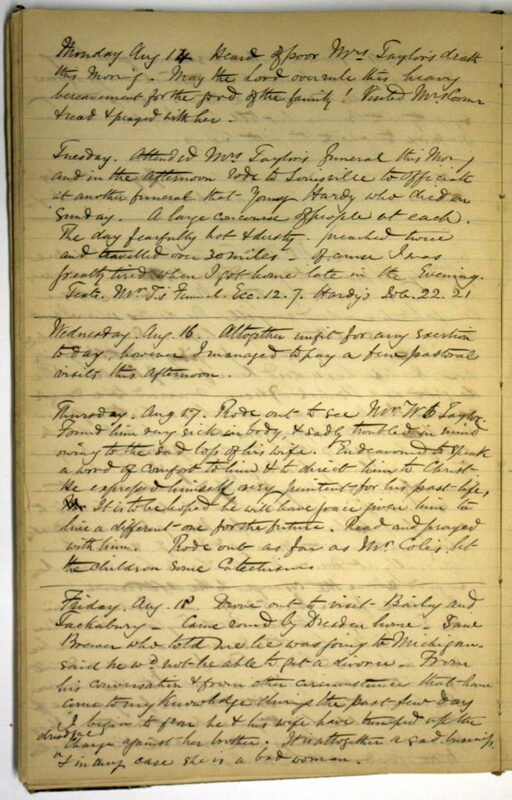 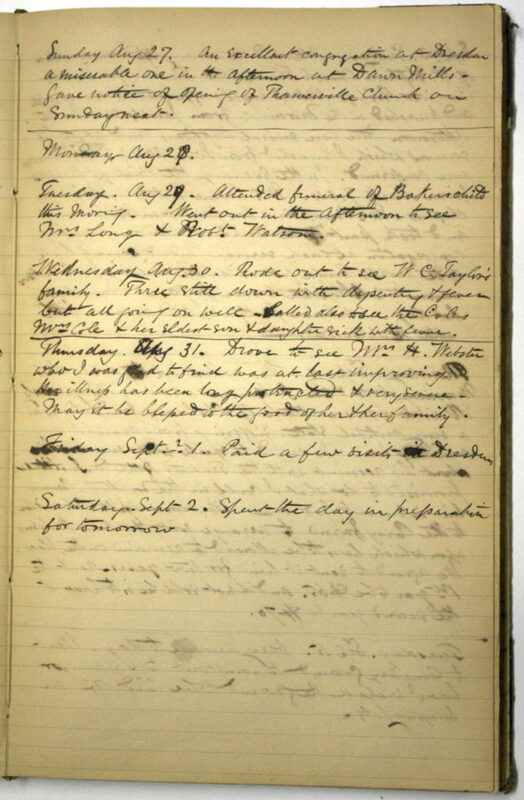 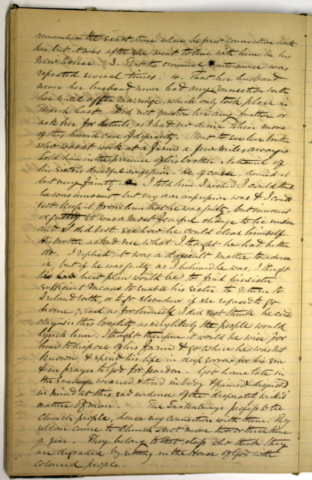 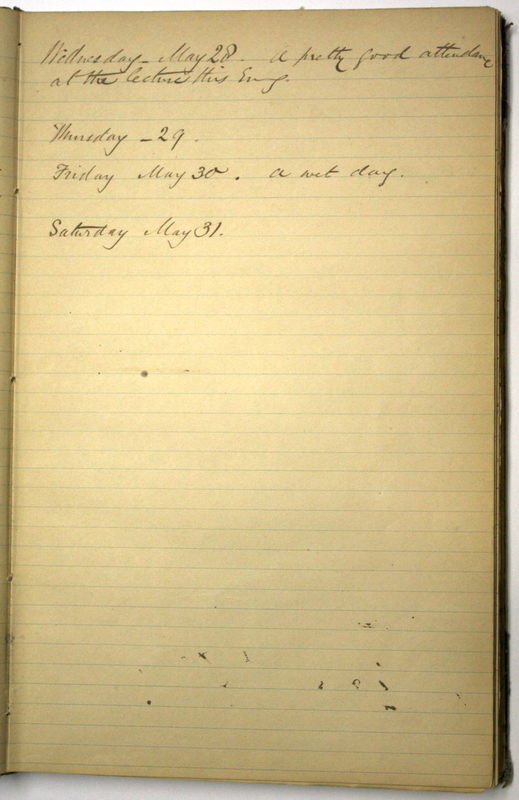 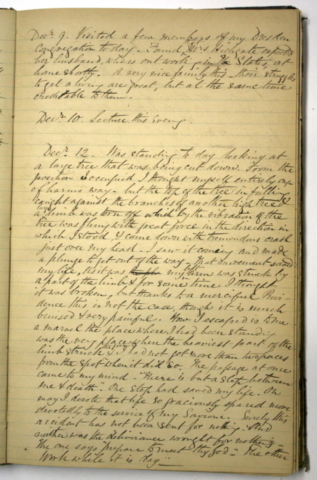 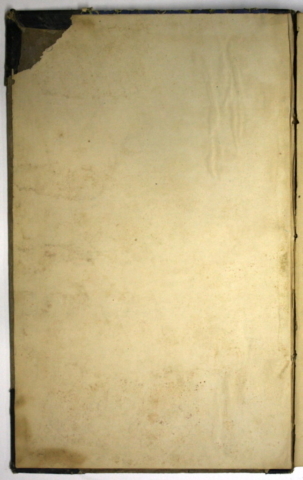 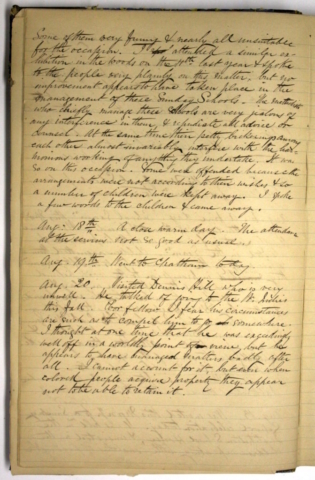 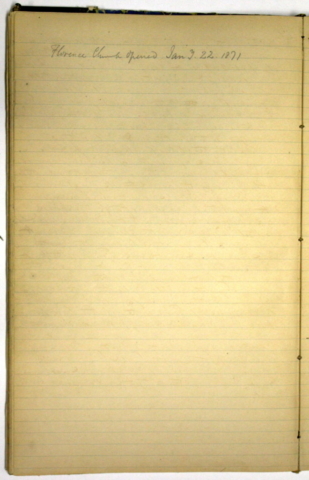 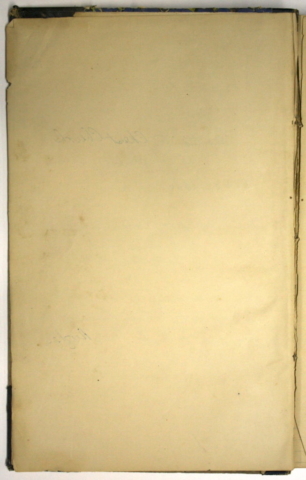 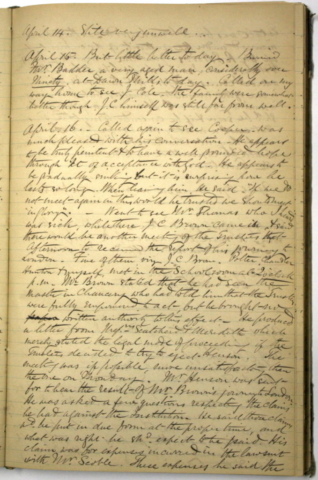 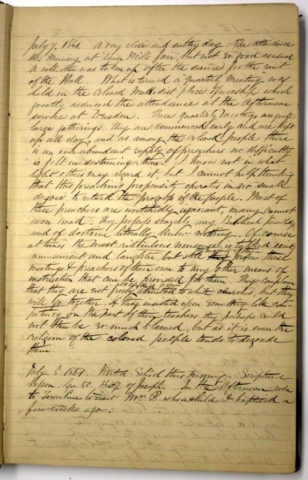 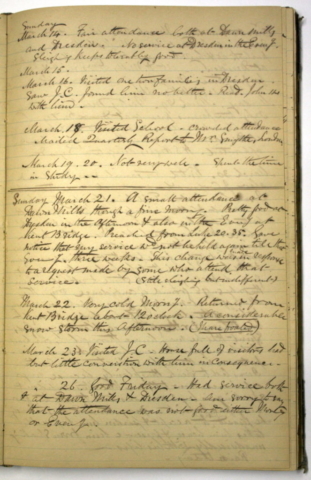 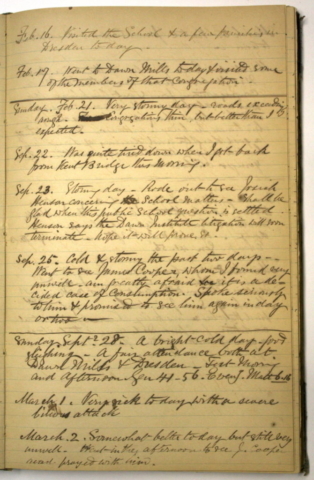 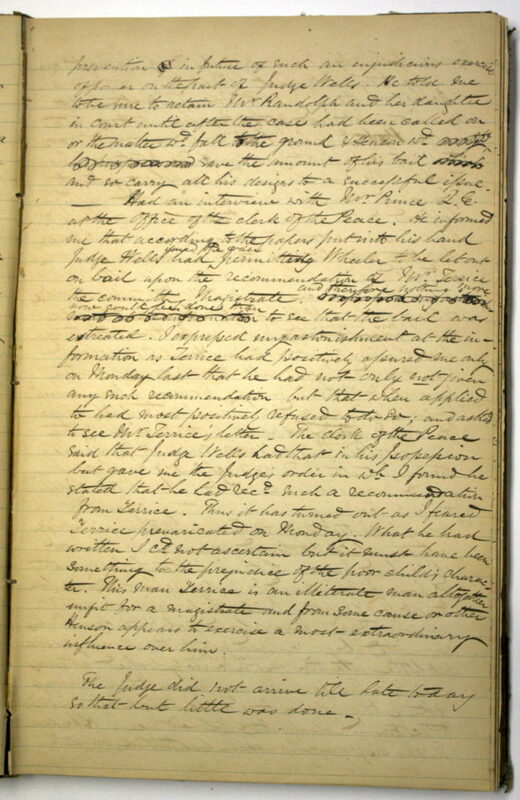 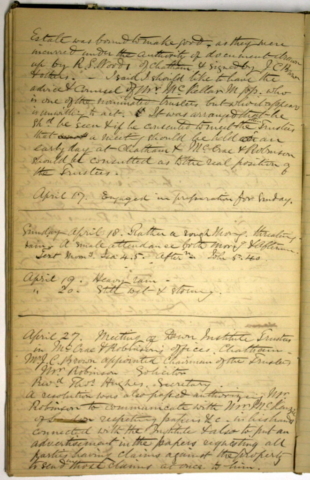 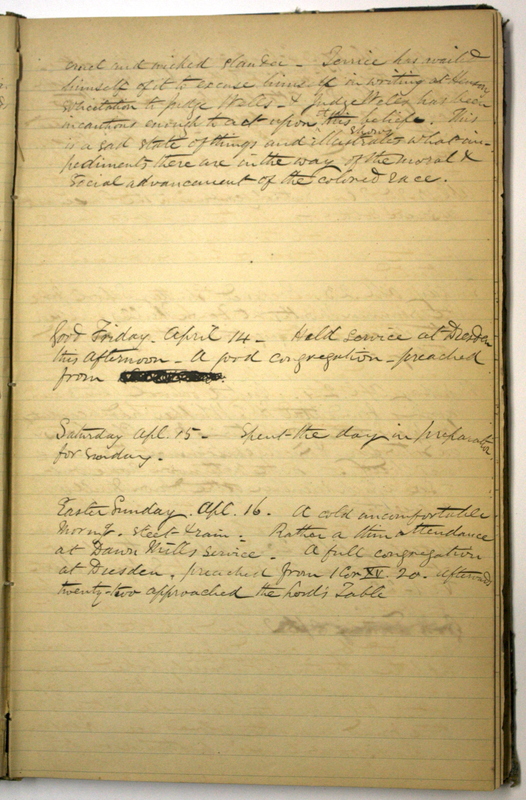 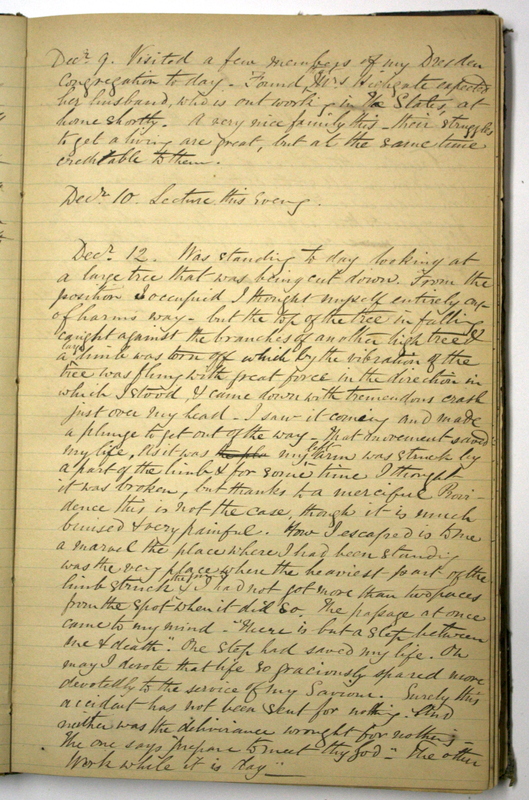 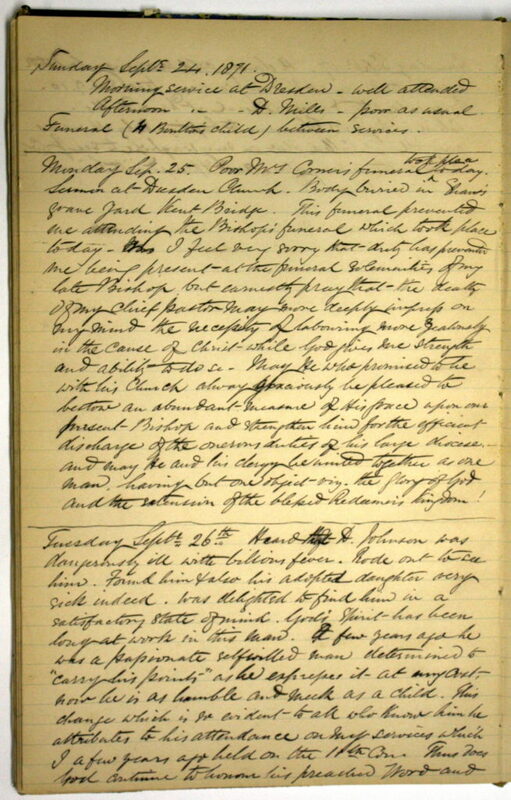 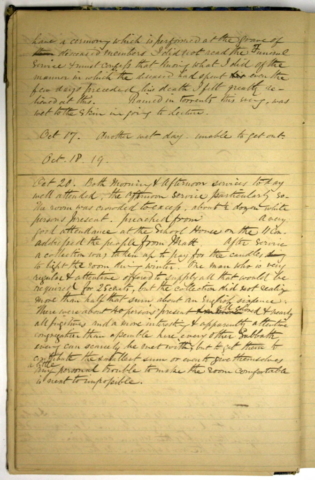 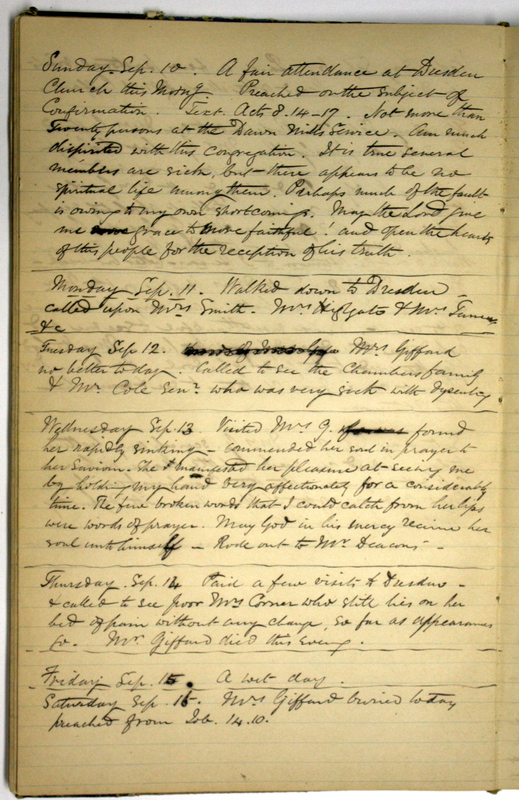 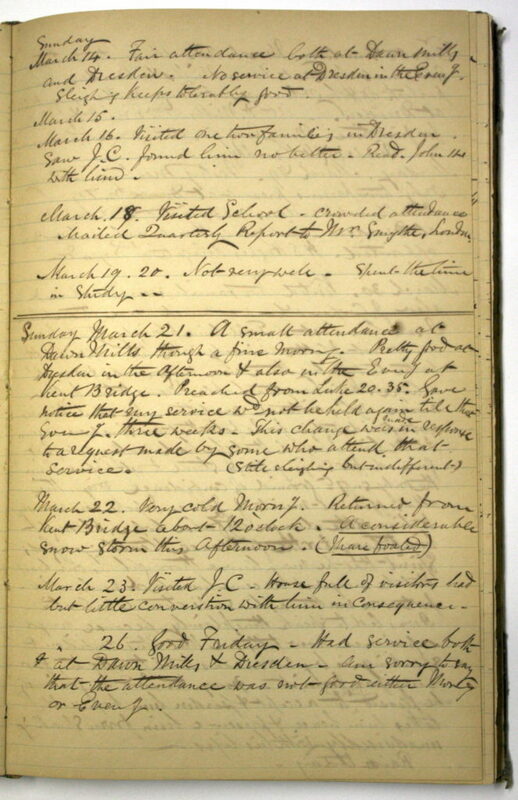 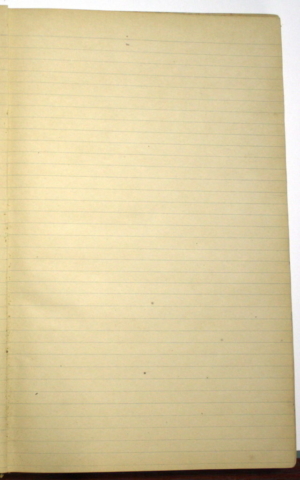 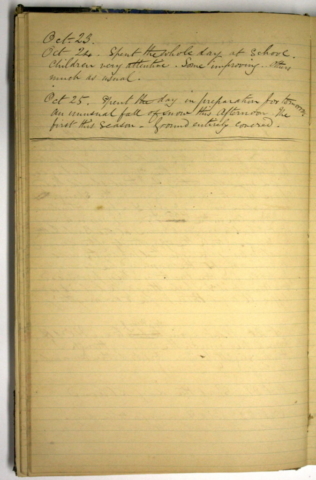 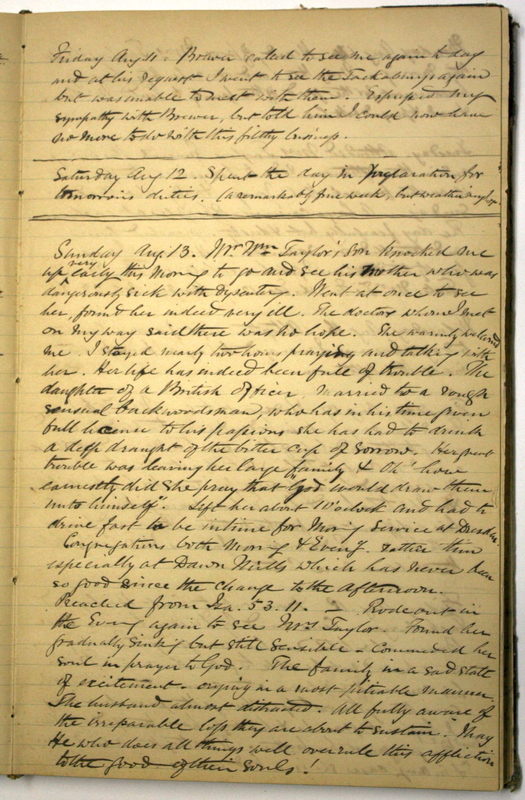 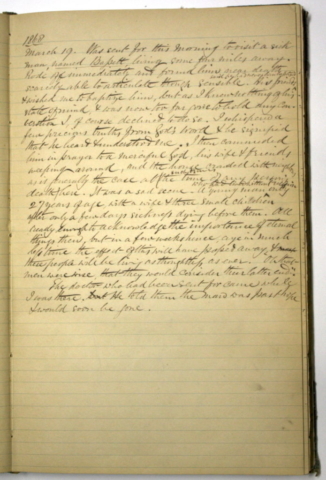 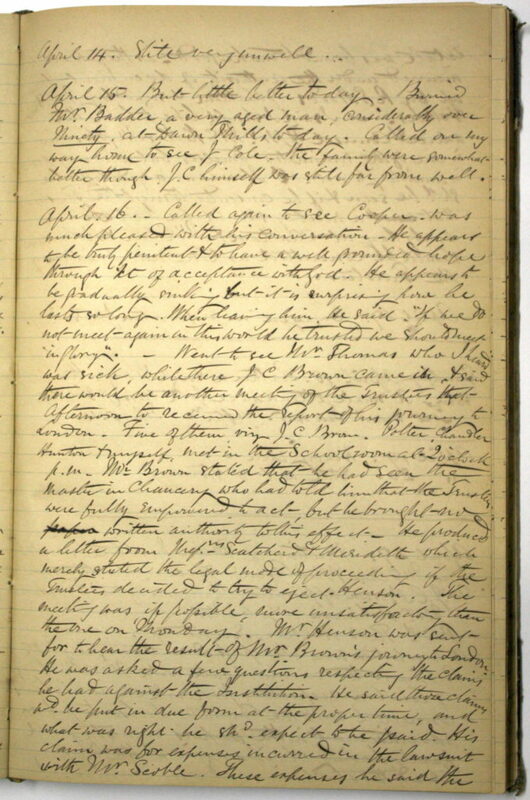 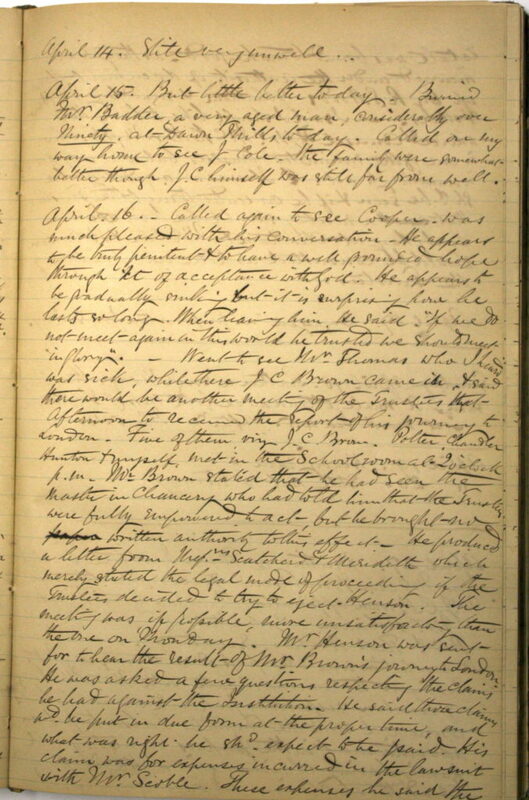 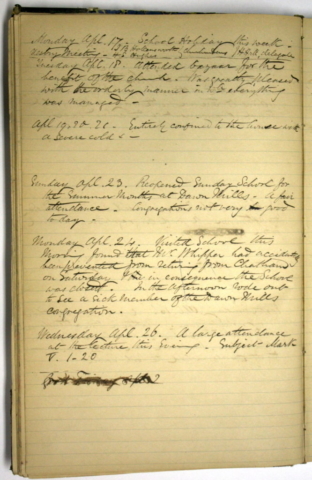 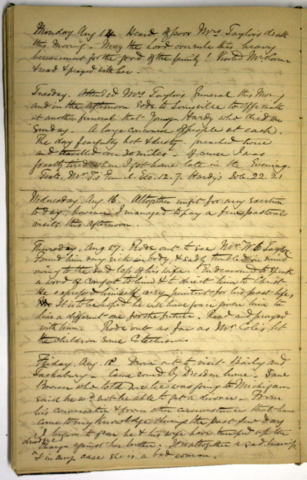 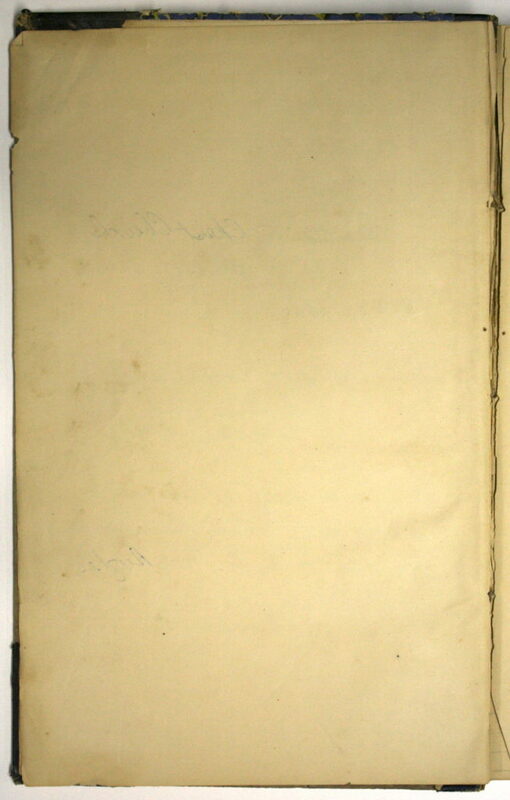 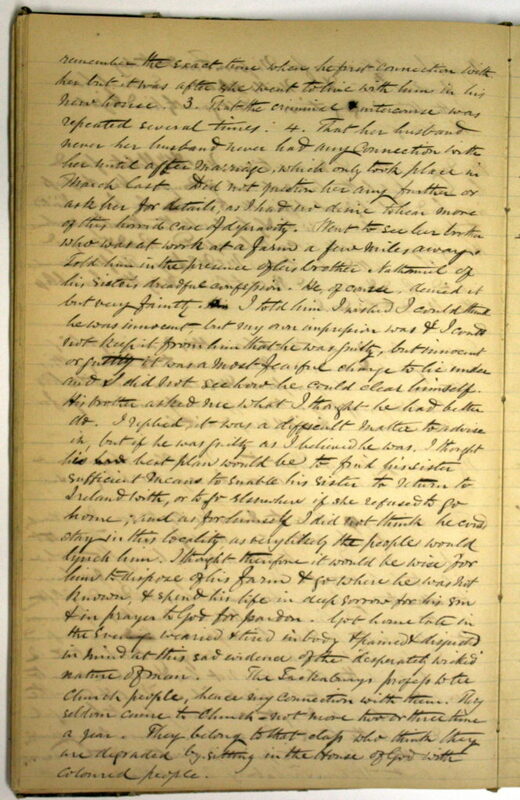 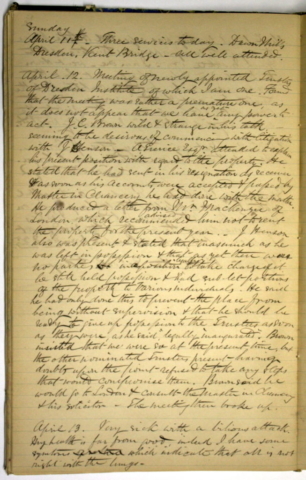 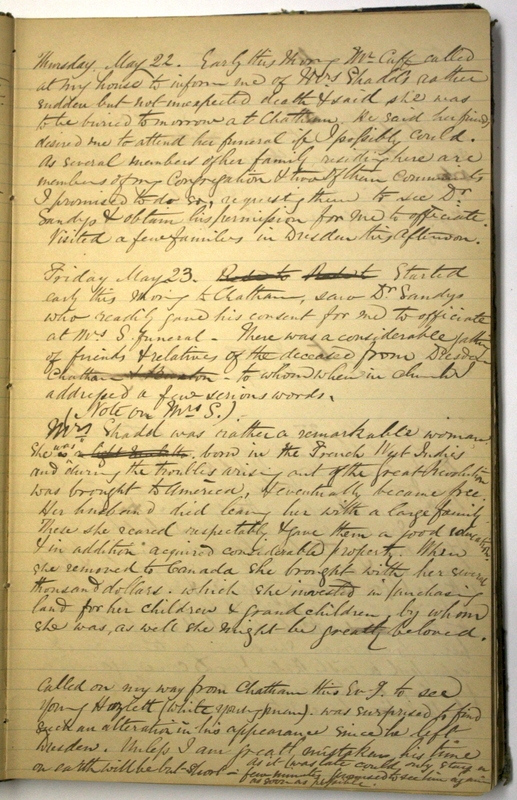 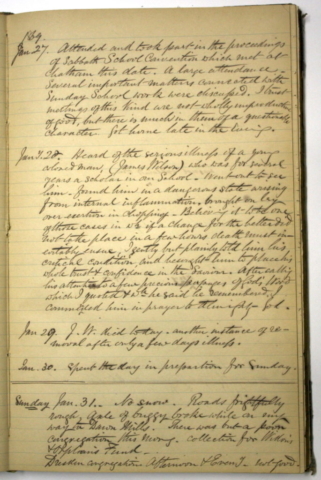 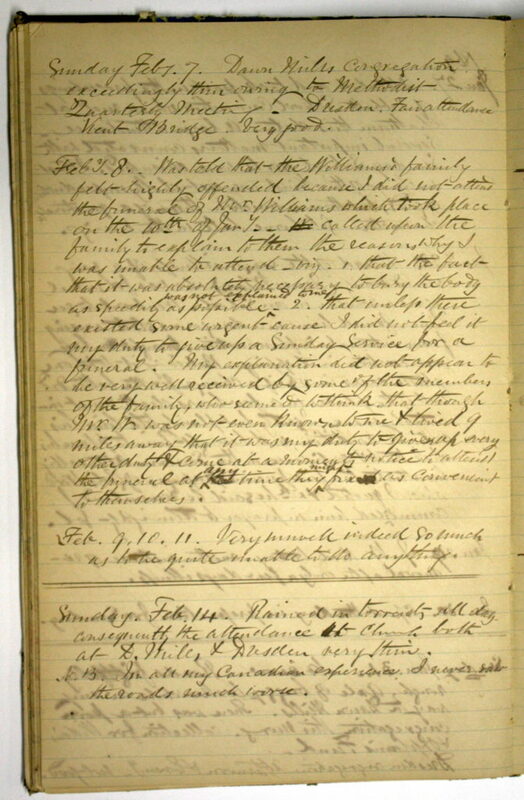 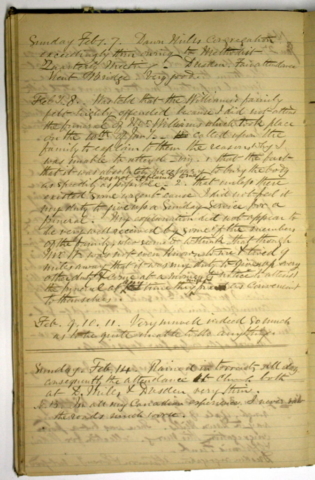 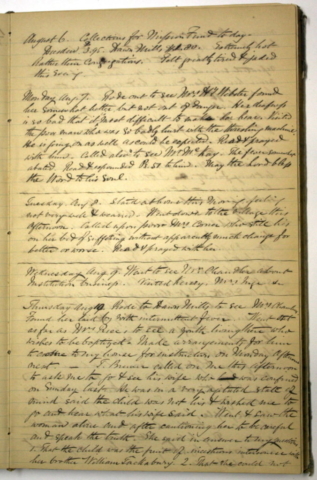 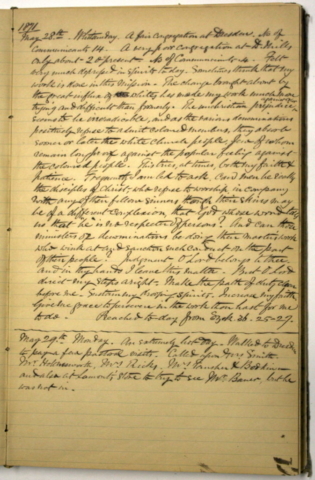 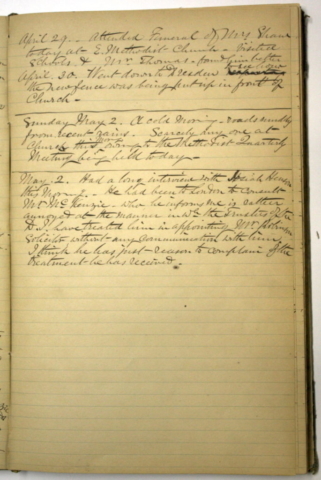 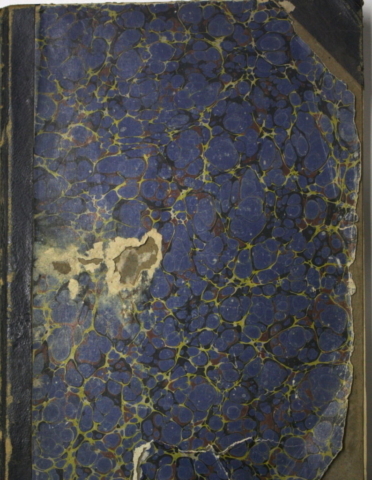 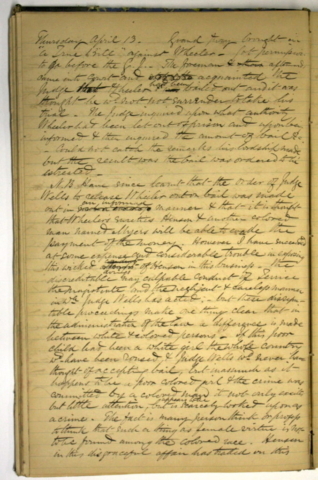 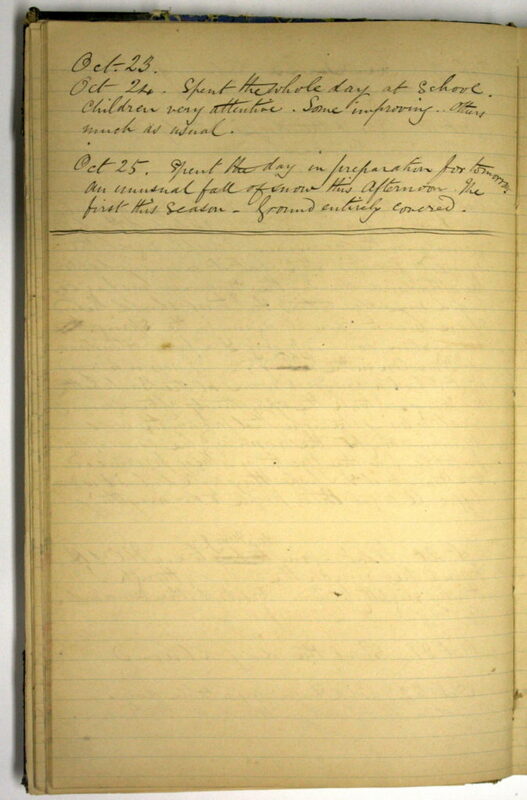 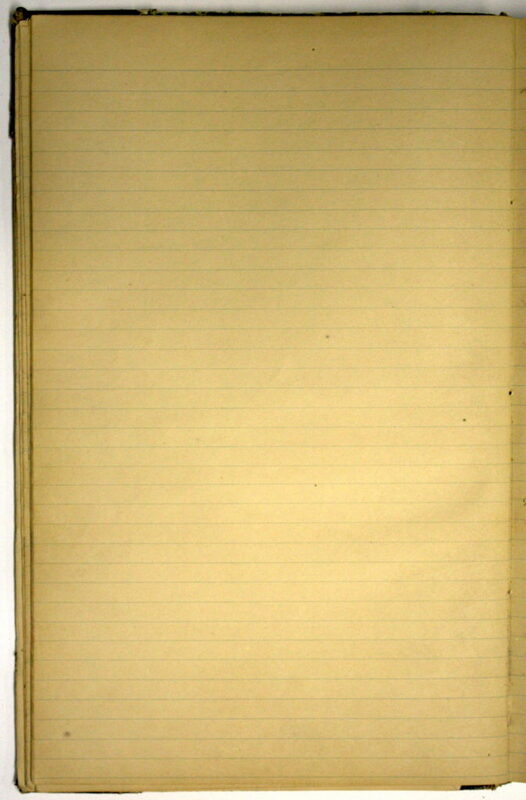 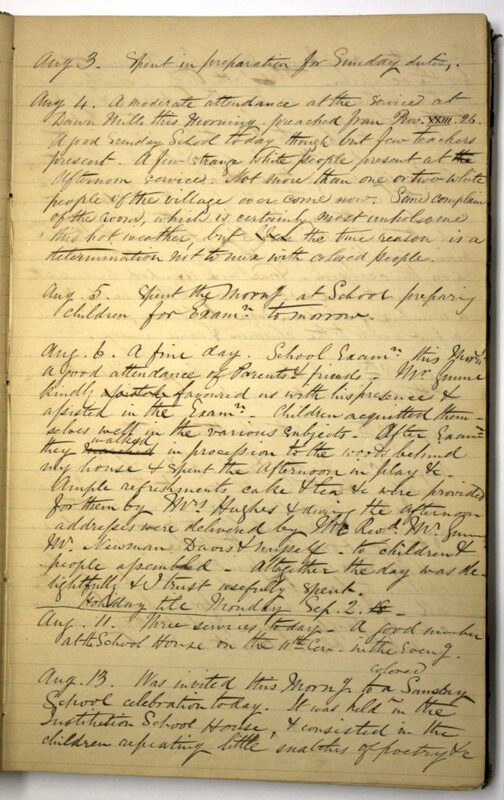 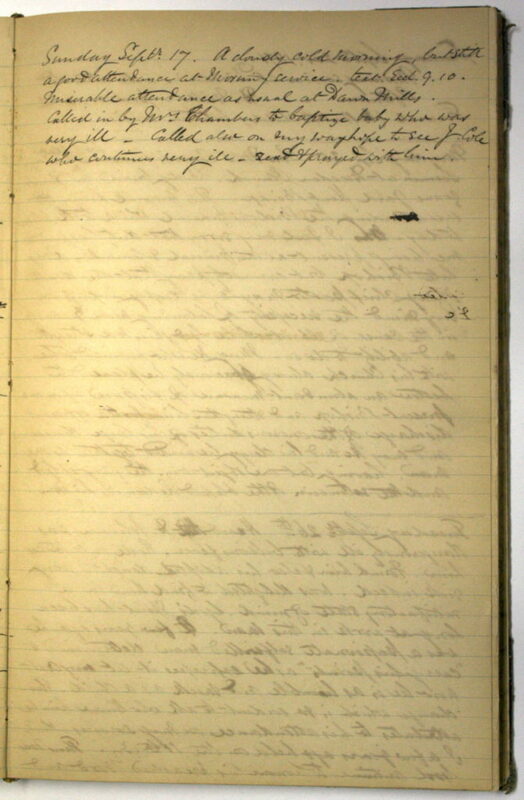 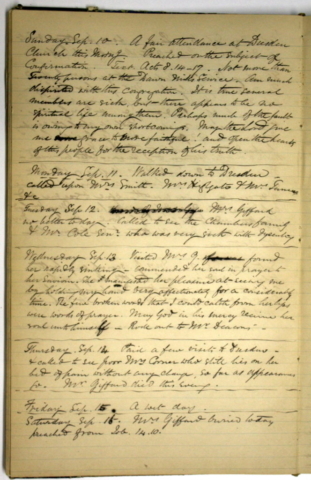 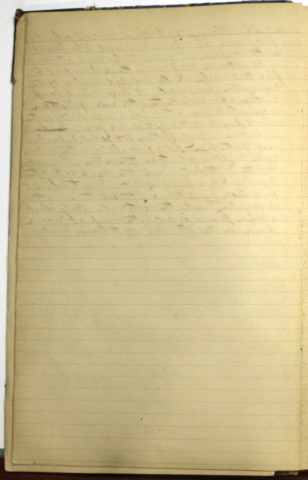 The story of Hughes’ work in Dresden, recorded in the diary below, is intimately connected to the broader history of anti-slavery work in Canada, the United States and Britain. It is also closely linked to the formation of the Diocese of Huron, and to the early history of Huron College. 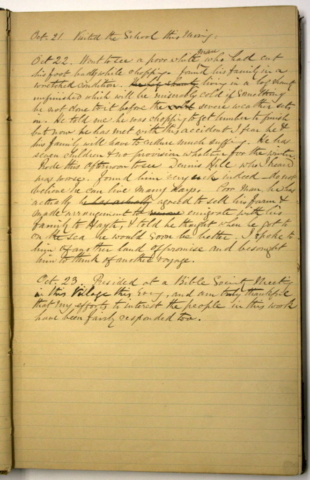 In the winter of 1856, Thomas Hughes was a teacher at Queen Mary’s Grammar School, Walsall, Staffordshire, when he applied for a position with the “Mission to Fugitive Slaves in Canada” established by the Colonial Church and School Society (CCSS) in 1854. 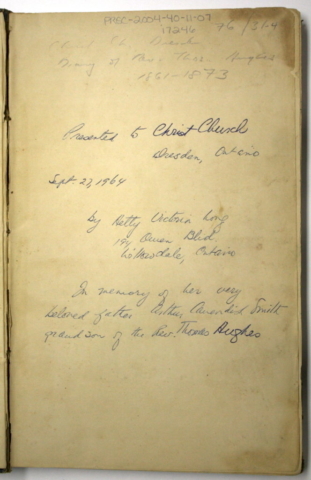 With the recommendation of the Reverend Isaac Hellmuth, later second Bishop of Huron, Hughes was hired to teach in London, Canada West, at the CCSS’s racially-integrated school. 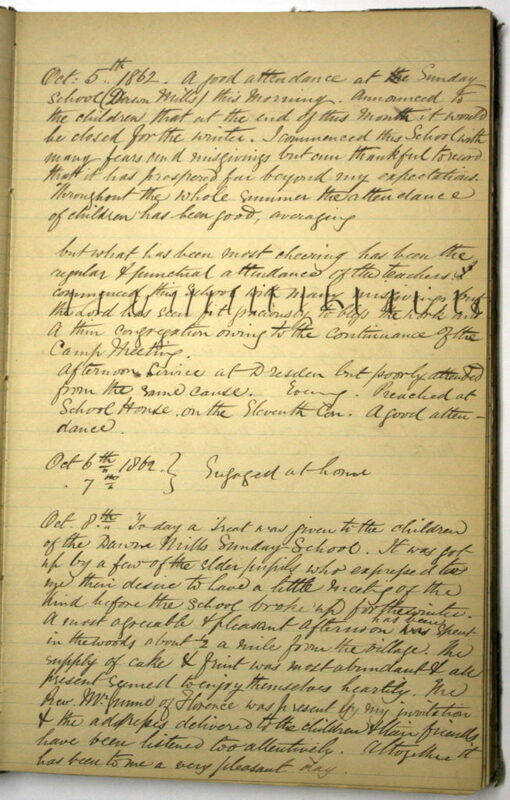 By 1859, under the influence of the example set by the CCSS Mission School, common schools in London were beginning to open up to black students, and the local committee of the CCSS decided to close the mission school in London and open a new mission in the village of Dresden. The move was encouraged by black abolitionists and community leaders in the area, who had protested the imposition of segregated education permitted under the Common Schools Act of 1850. 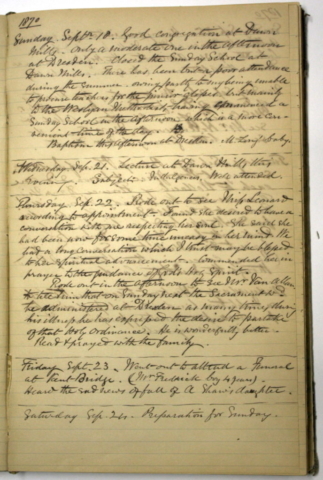 As he was preparing for his new post in Dresden, Hughes studied for holy orders under the guidance of then Archdeacon Hellmuth, and the Reverend Benjamin Cronyn, first Bishop of Huron. He was priested by Hellmuth in December, 1859. 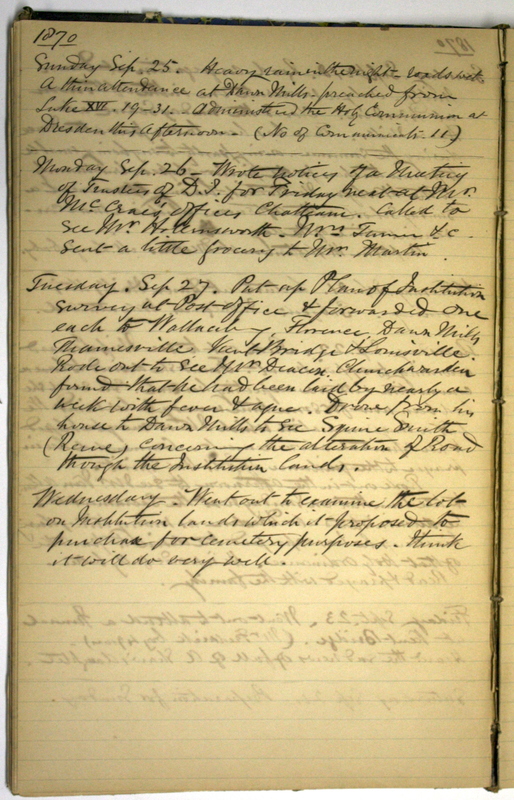 A few months before his ordination, accompanied by another teacher from the London school, Jemima Williams, Hughes, his wife Ann and their family moved to Dresden. 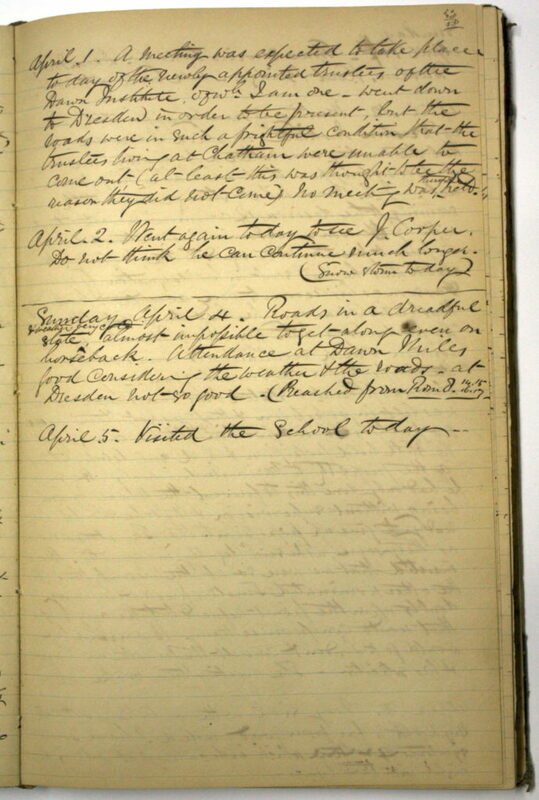 Here Hughes established a school, presided over by Jemima Williams until her untimely death in the winter of 1860, and a flourishing congregation in Dresden. 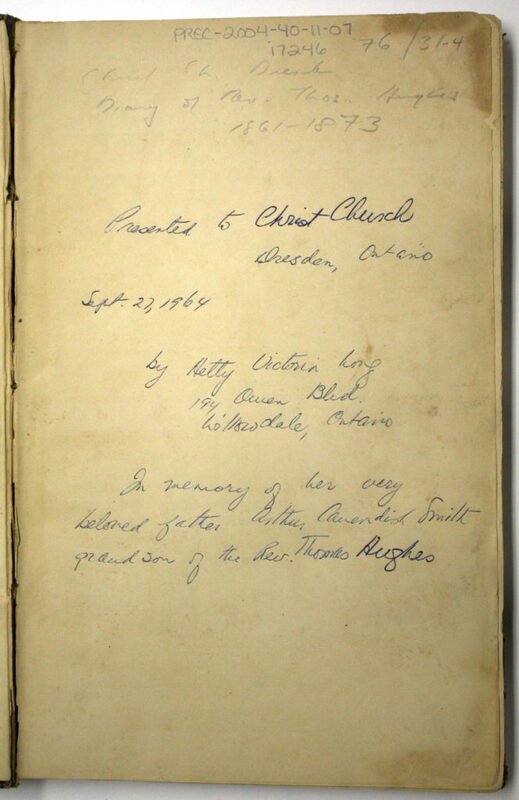 A second church congregation at Dawn Mills soon followed. 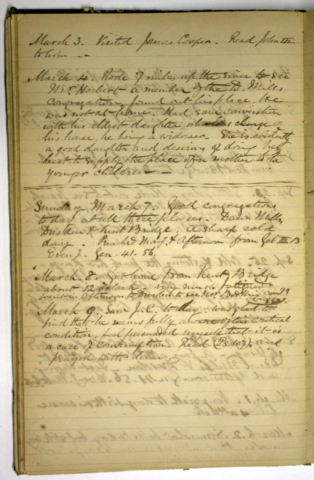 Throughout his ministry in Dresden, Hughes maintained a close friendship with members of the established black community who had made Dresden a flourishing place in the 1840s and 1850s. 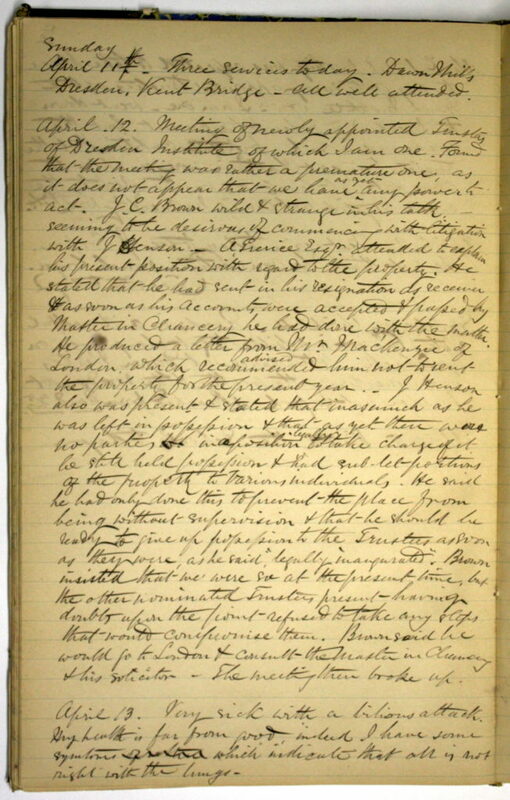 Through the years of the American Civil War and beyond,Hughes continued in his “Mission to Fugitive Slaves” even as the institution of American slavery crumbled. 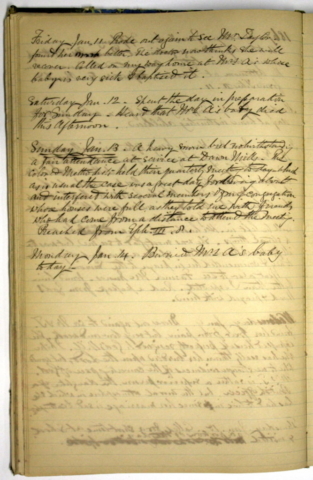 His diary reveals the long frustrations of confronting a deepening racial prejudice among his white congregants, and the persistence of that prejudice even in the “promised land” of Canada West. 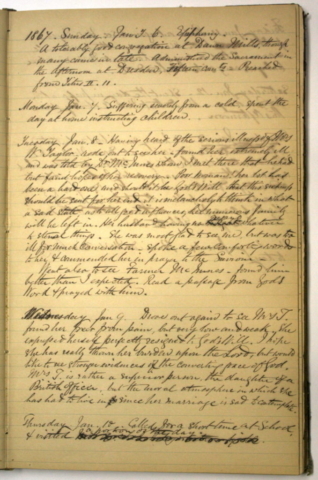 Hughes served as a trustee during the troubled later years of the British American Institute; one of the best-known tributes to his life in Dresden was written by his friend, the Reverend Josiah Henson, and was published in Henson’s 1876 version of his autobiography. 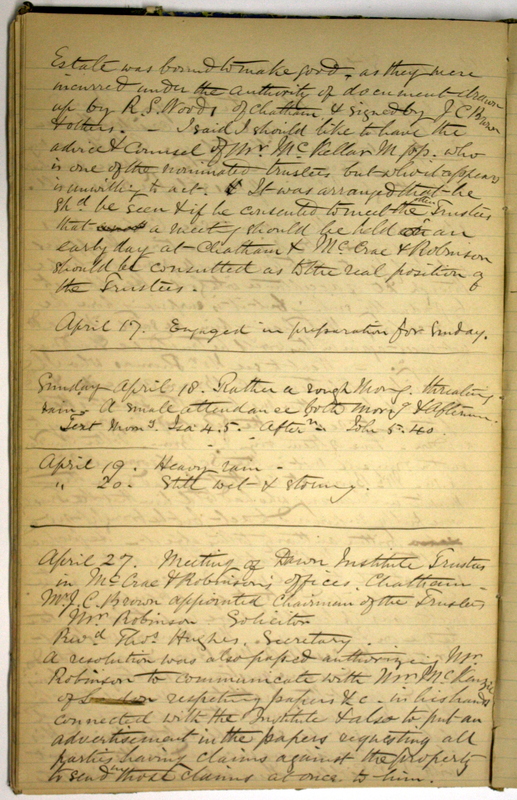 Hughes died on April 12, 1876, and was buried in the racially-integrated burial ground for the Christ Church, Dresden congregation in the Dresden cemetery. 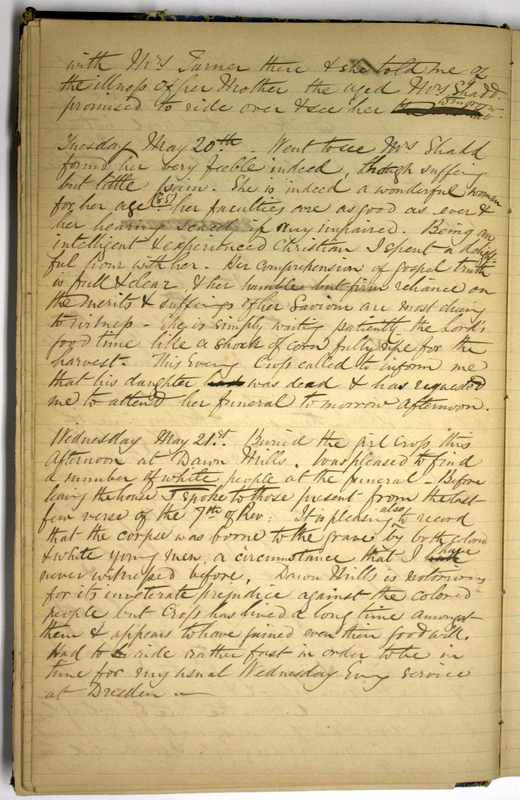 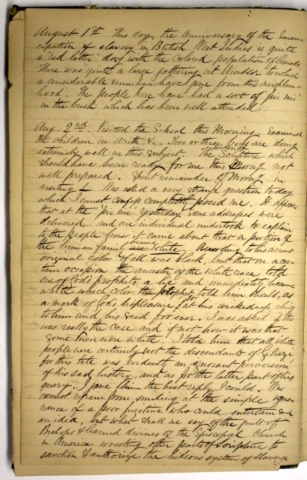 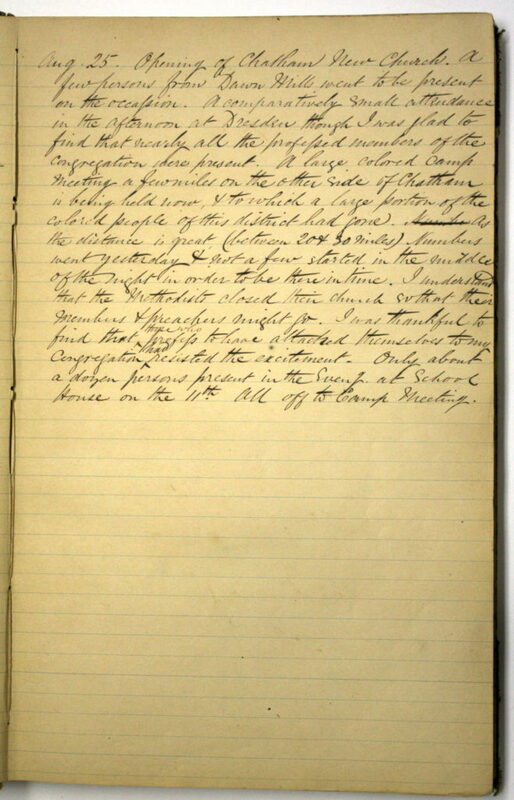 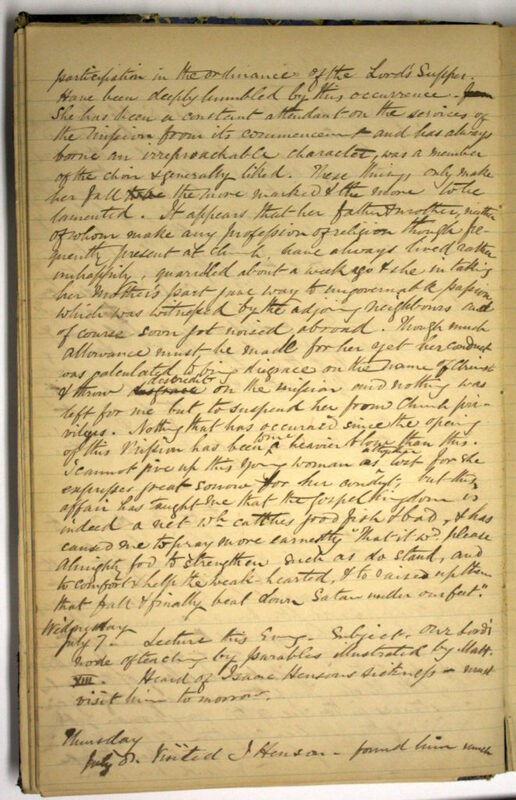 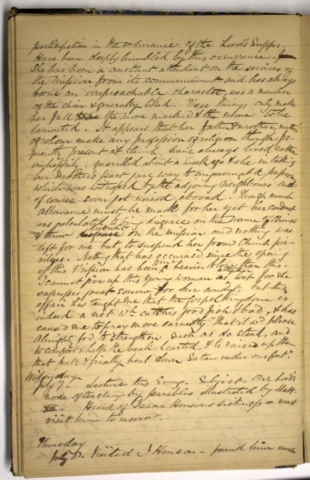 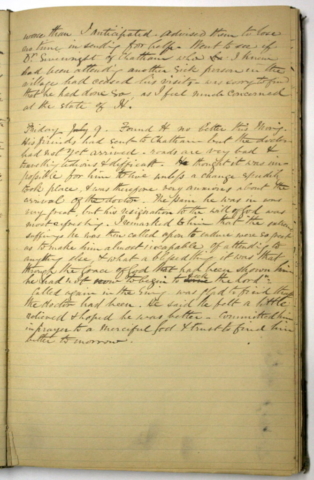 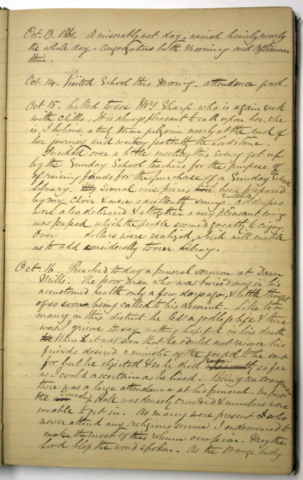 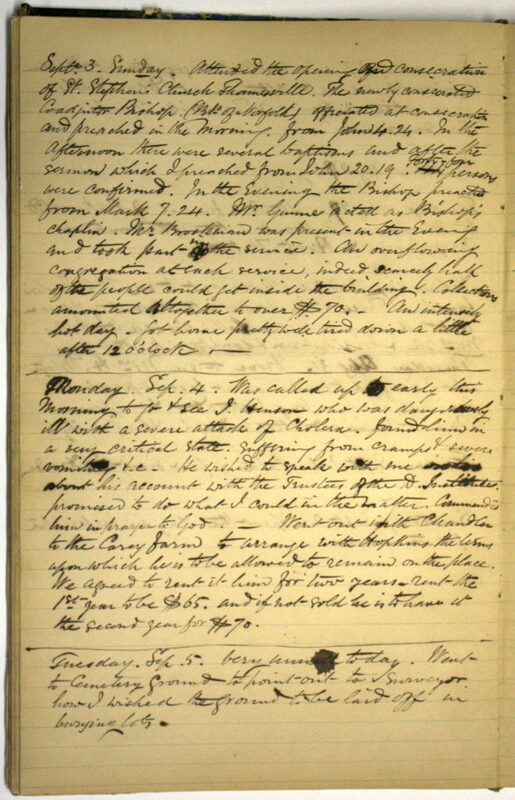 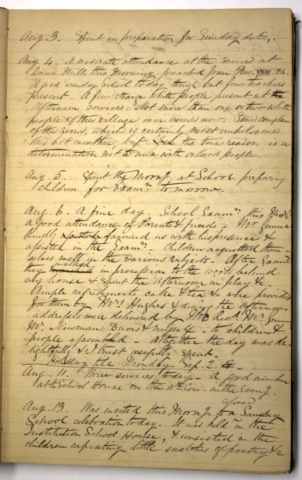 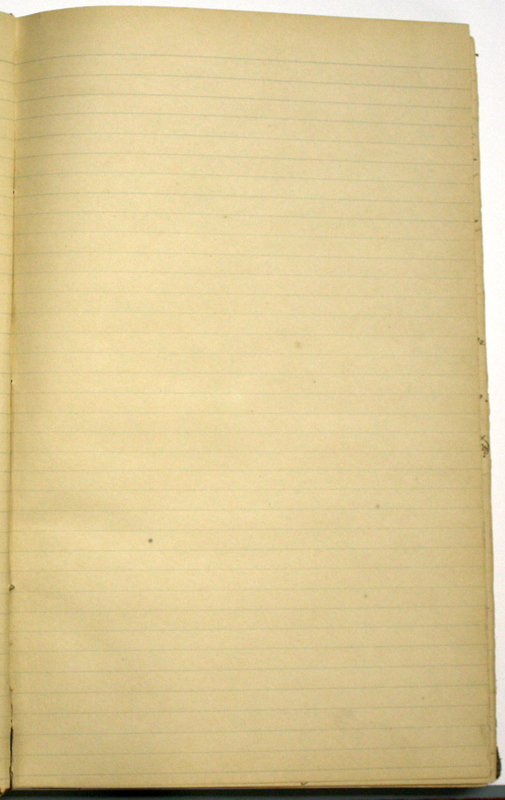 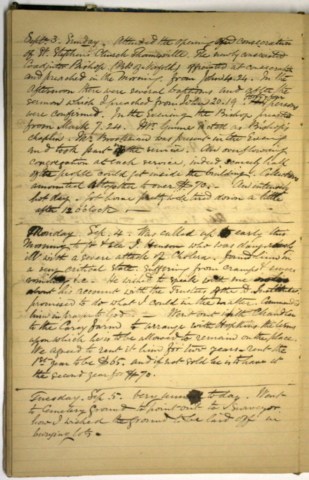 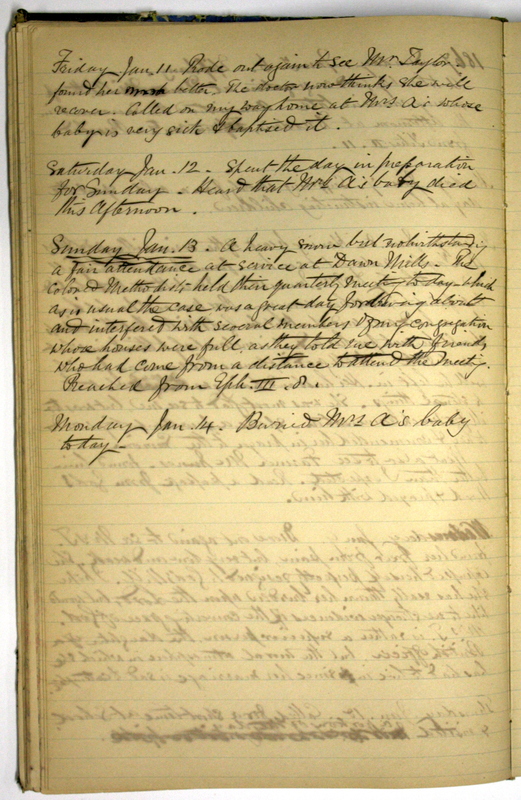 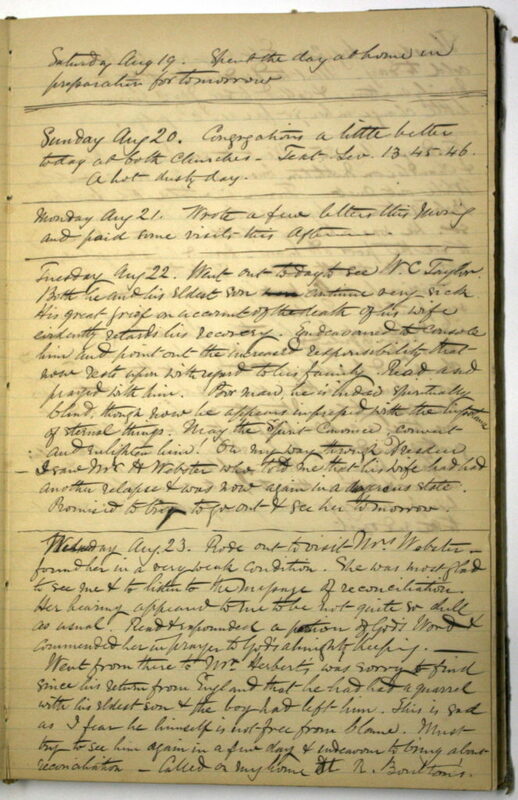 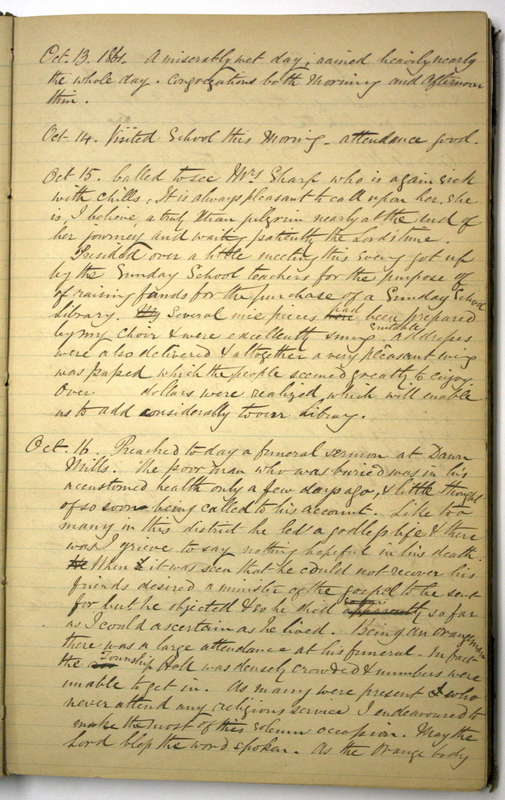 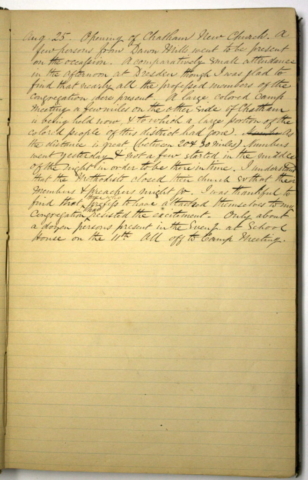 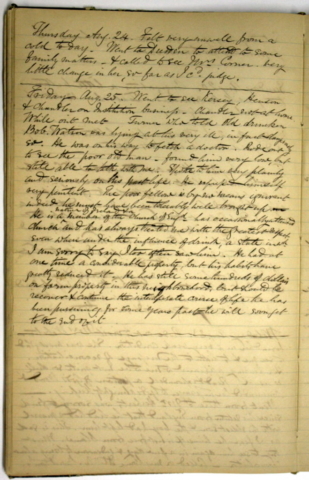 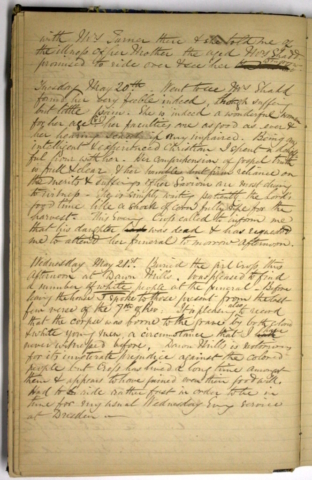 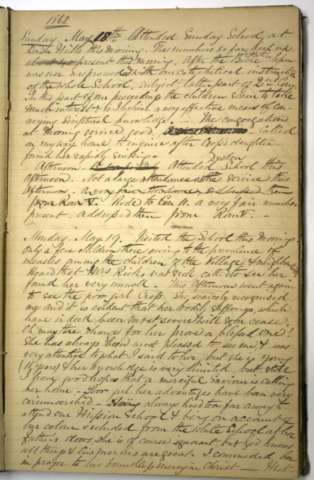 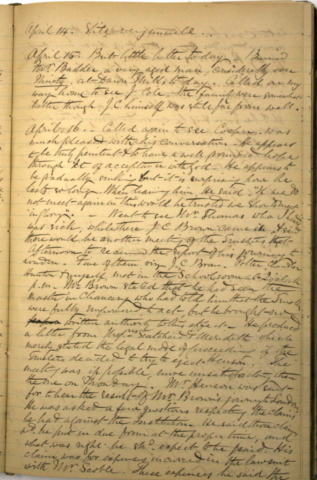 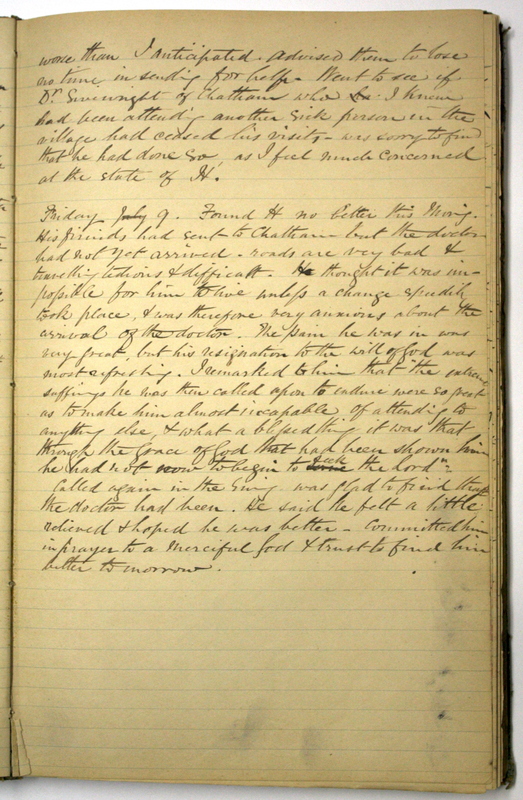 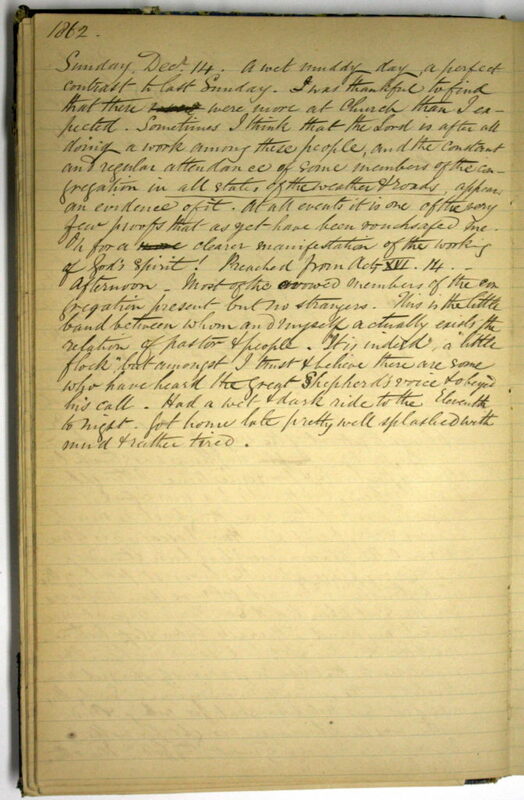 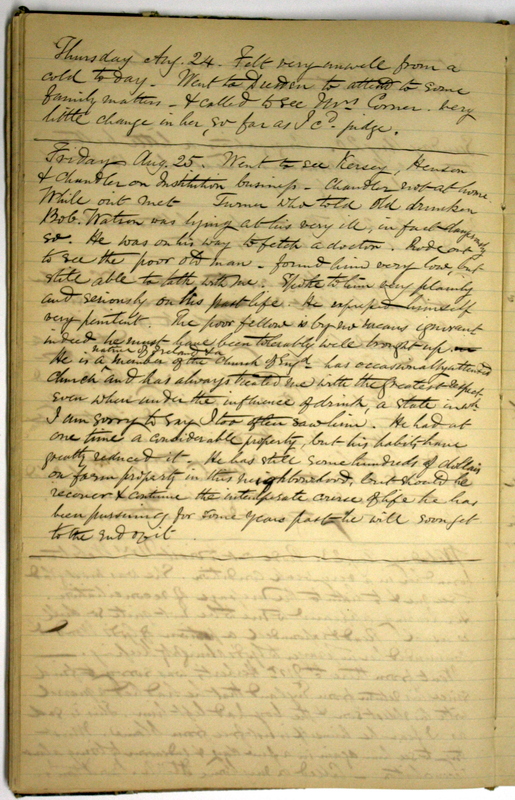 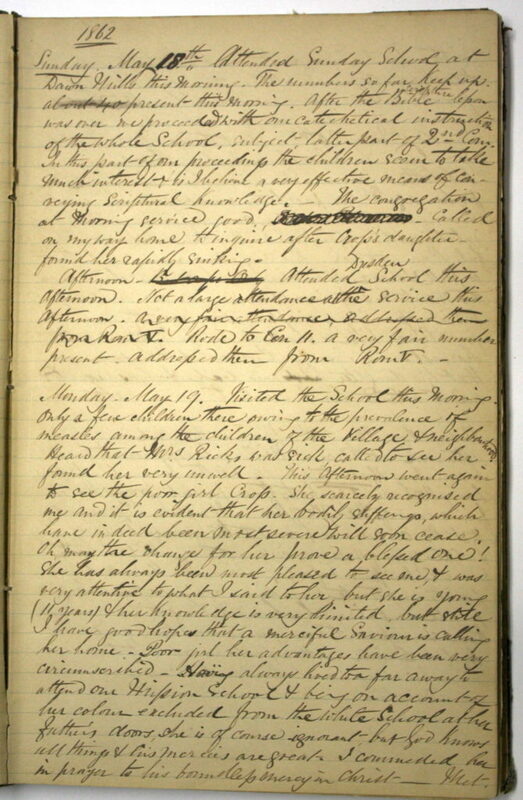 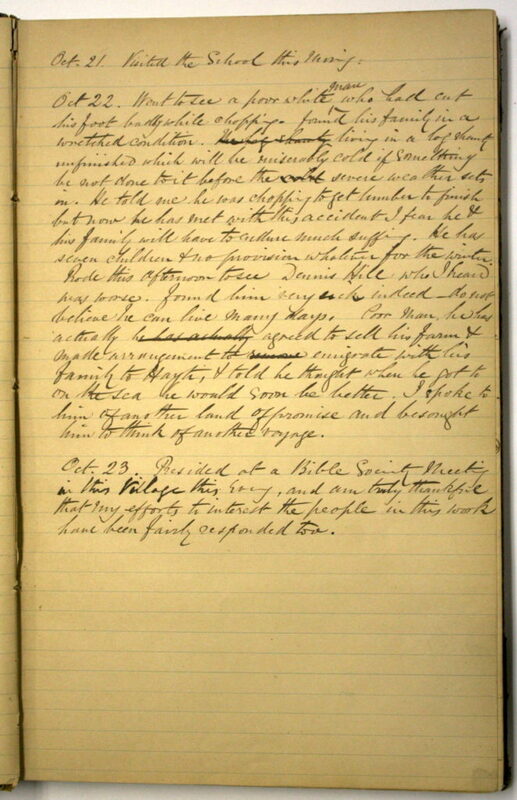 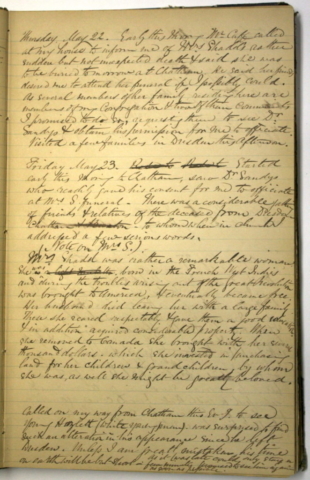 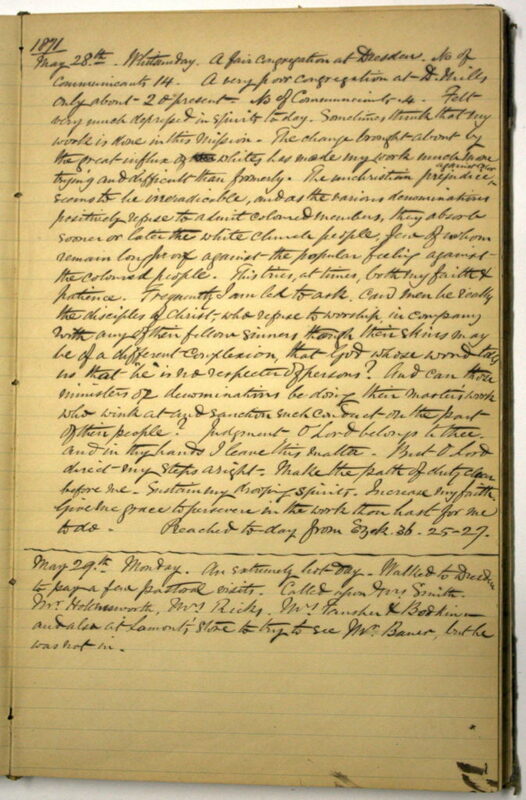 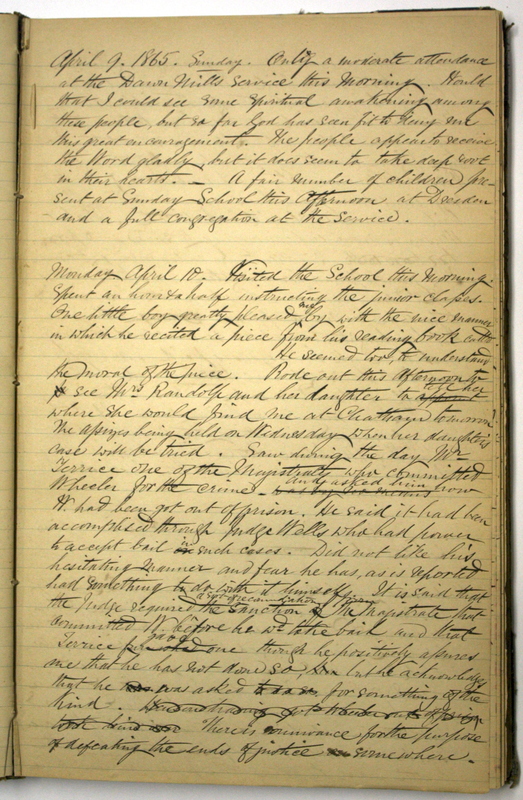 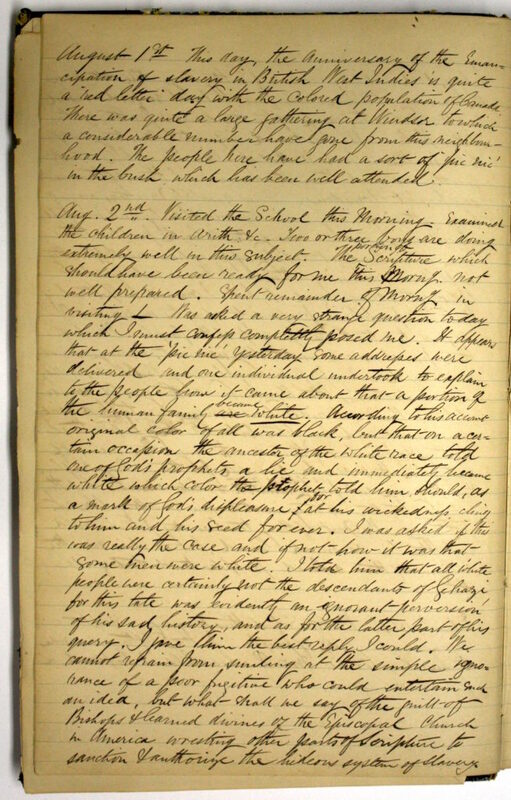 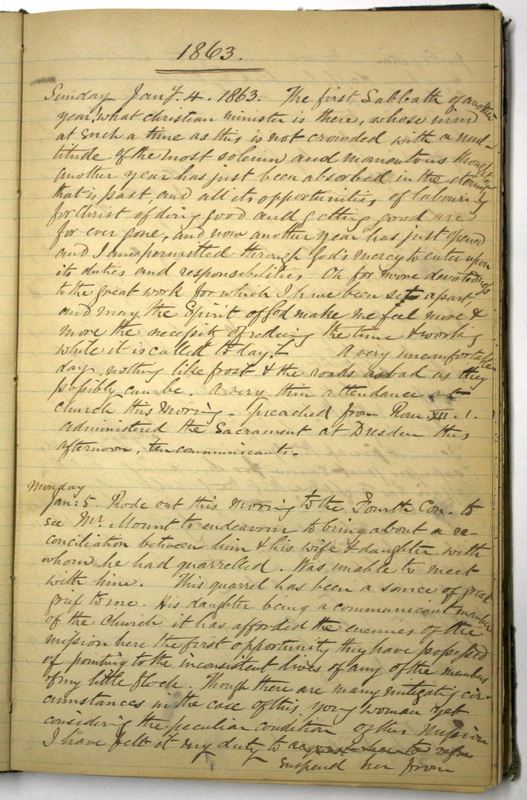 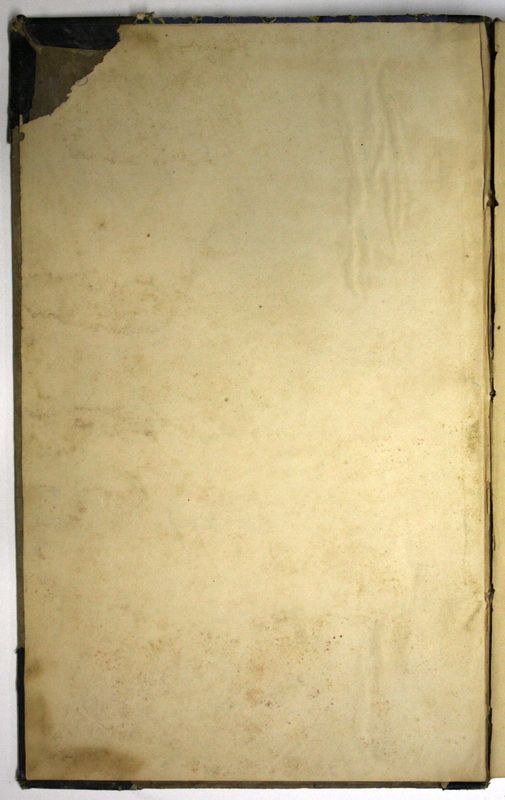 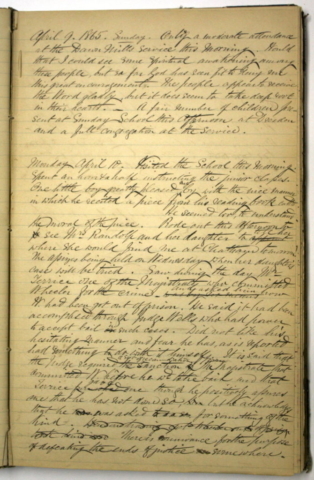 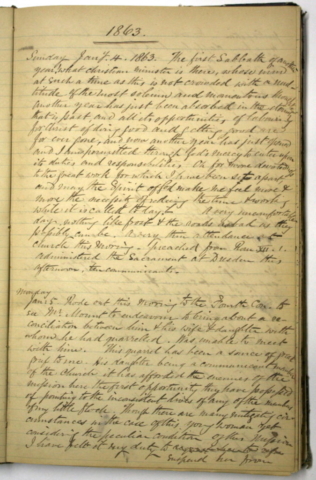 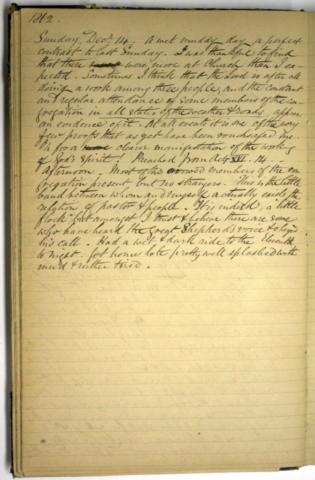 Hughes’ Diary, reproduced here with the permission of the Diocese of Huron archives, is part of the Phantoms of the Past project’s digital archive of primary sources.